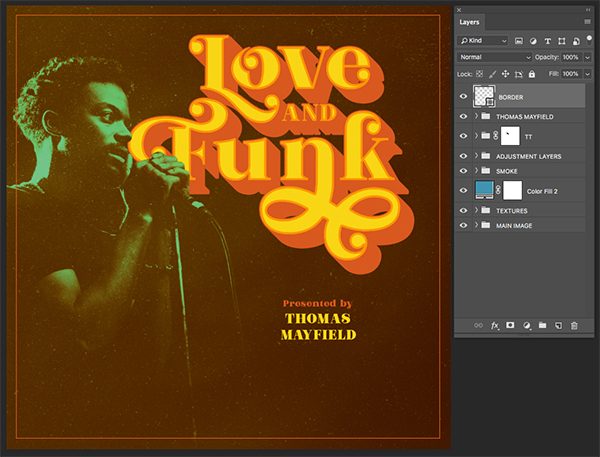 In this tutorial, I will be showing you how to design a retro album cover straight out of the 70’s! 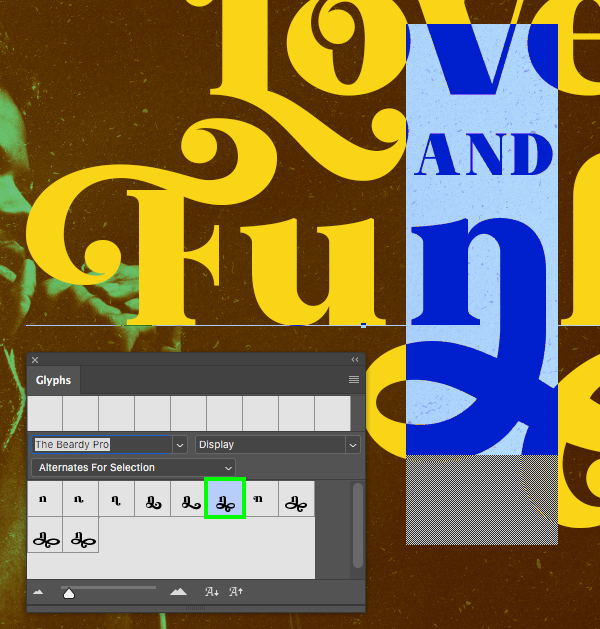 To create our album cover we will be using The Beardy typeface from Aiyari which is just one of several beautiful fonts that you will find in The Amazing Designer’s Creative Collection. 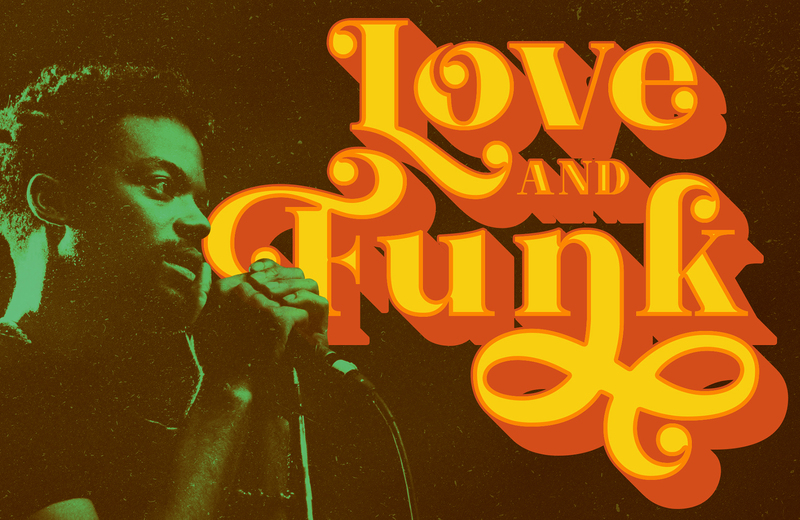 Along with these great fonts, you will also find various brushes, textures, lettering kits and watercolour collections from some of the top creators in the industry today. If you’re all ready for a blast from the past then fire up Photoshop and let’s get started! 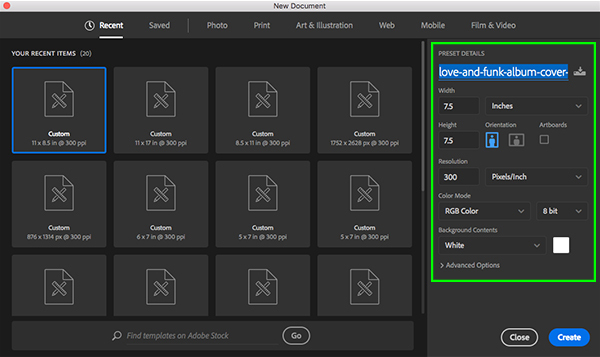 Begin by opening Adobe Photoshop and create a New Document that is ‘7.5’ inches wide by ‘7.5’ inches tall with an RGB Color Mode and a Resolution of 300 ppi. 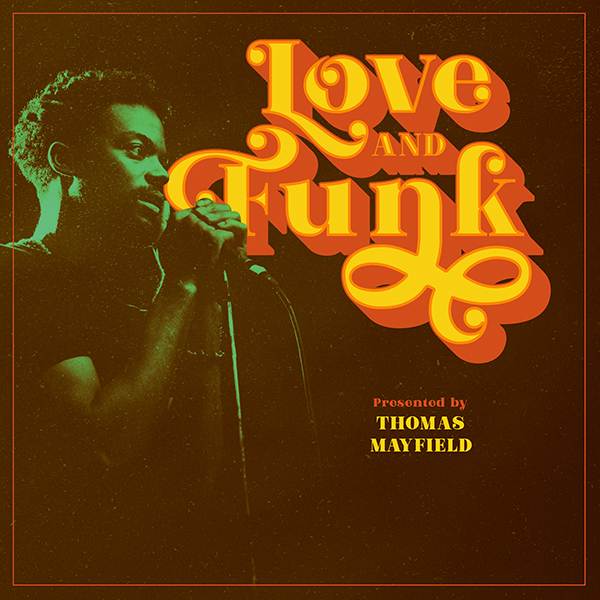 Let’s also take a moment to name our file – here I will name my file ‘love-and-funk-album-cover-design’ but feel free to call it anything you would like. Once you have set that up, go ahead and click on the ‘Create’ button at the bottom right of the dialog box to make your document. 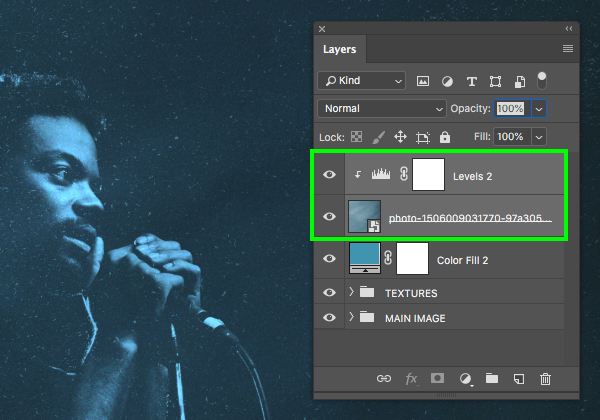 You will now have a single ‘Background’ layer with a small lock icon next to it in the Layers Palette. 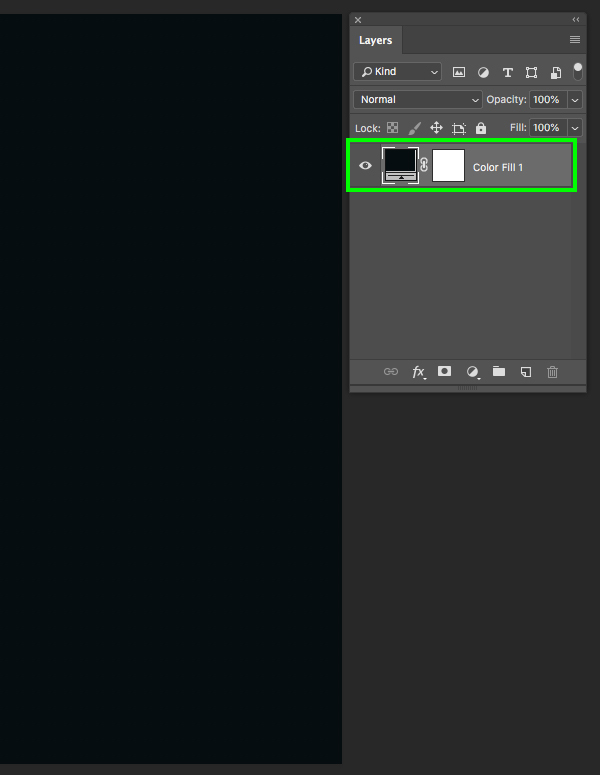 Let’s go ahead and click on the Adjustment Layer icon from the bottom of the Layers Palette and then choose ‘Solid Color’ from the menu that appears. 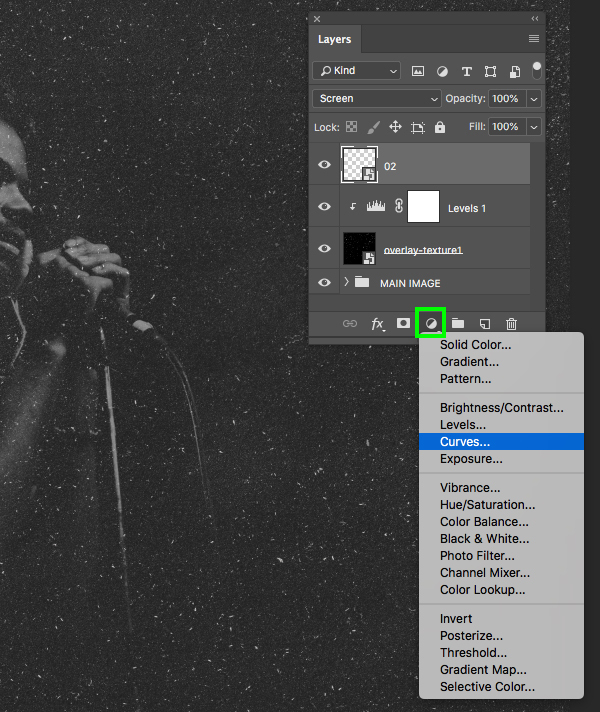 For the fill color, enter the hex value ‘#060D10’ and then press ‘Return’ on the keyboard or click ‘OK’ to proceed. 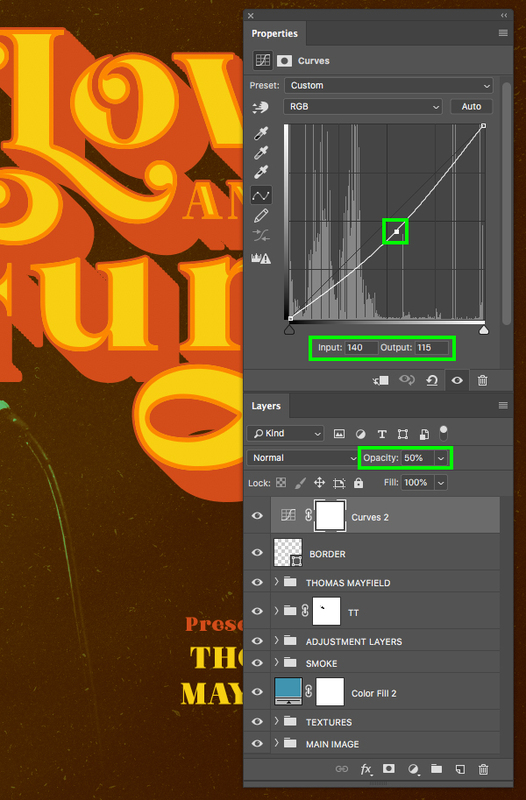 After adding the Adjustment Layer let’s go ahead and drag the original ‘Background’ layer to the trash since we no longer need it. 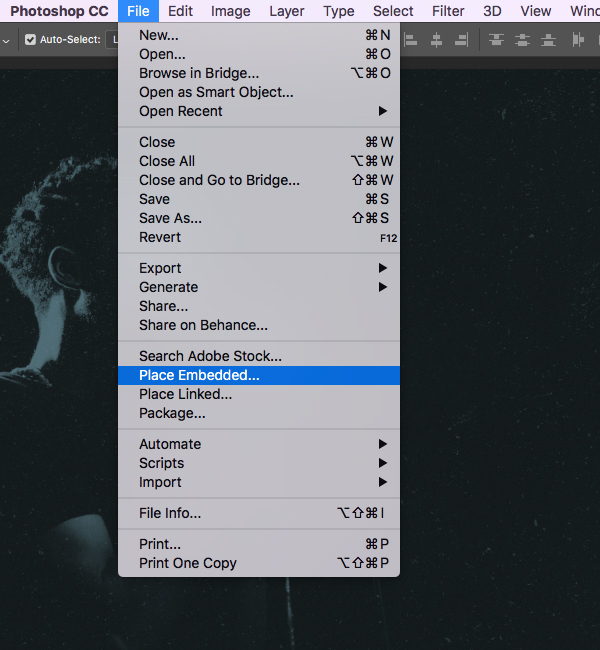 Next, go to the File menu and choose ‘Place Embedded…’ from the drop-down that appears. 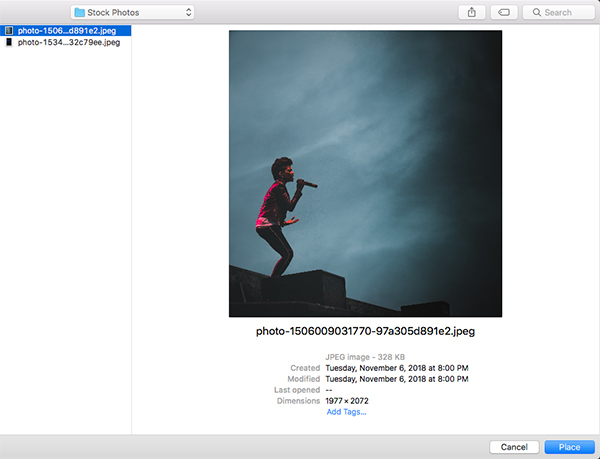 Navigate to the folder or location where you’ve downloaded the image of the lead singer which you can download here from Unsplash. 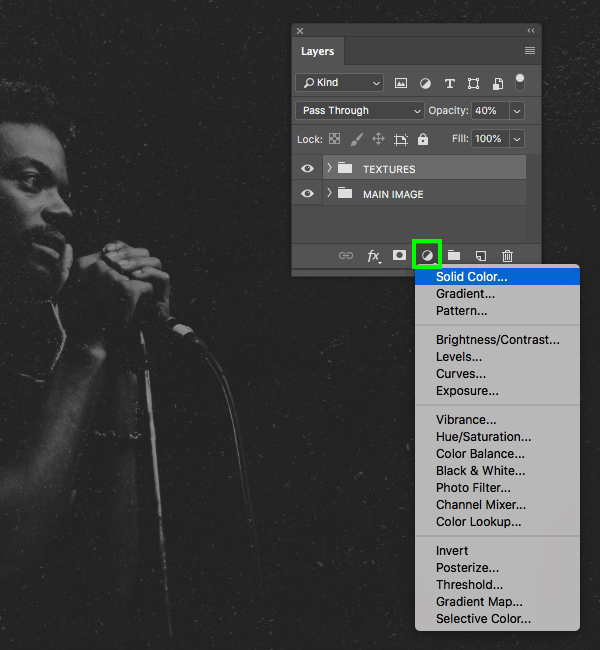 Once you’ve located the image, choose ‘Place’ from the lower right corner to bring it into your document. 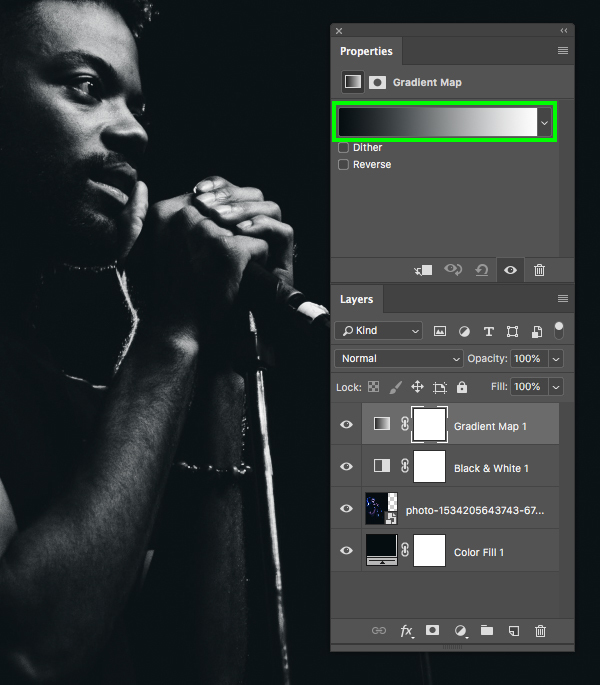 After sizing and positioning the image of the singer, select the Adjustment Layer icon from the bottom of the Layers Palette and then choose ‘Black & White…’ from the menu. 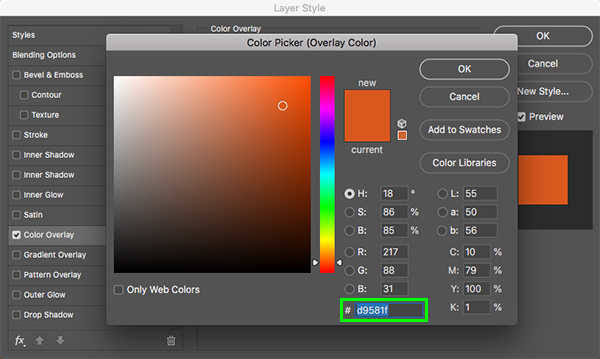 Return to the Adjustment Layer icon again and this time choose ‘Gradient Map…’ from the list to add it to the top of your Layers Palette. 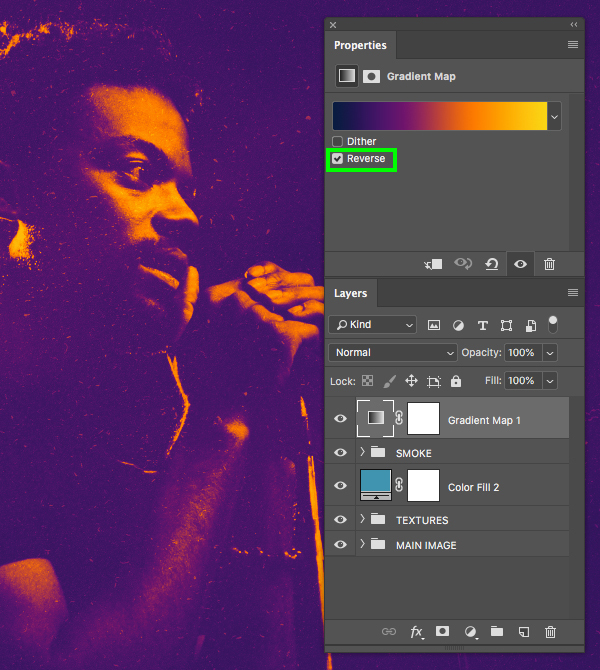 In the Properties section we will now click on the gradient strip to modify the colours. 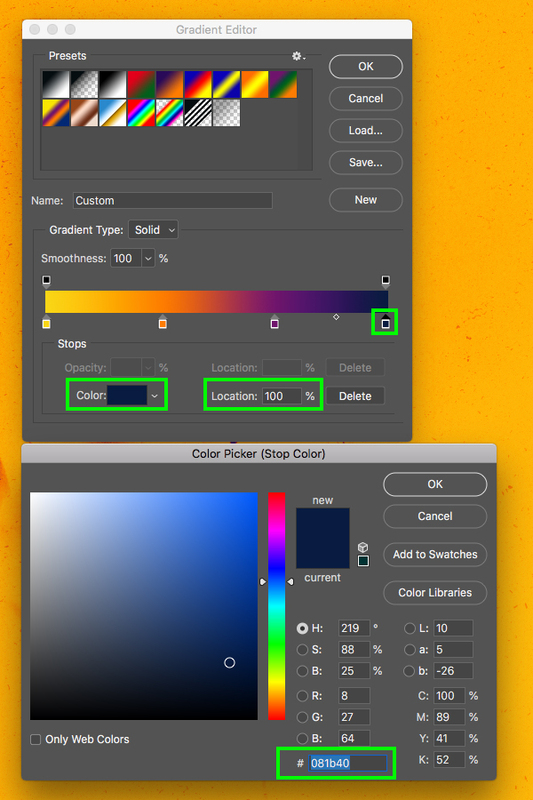 Once the Gradient Editor appears, click on the lower left square and then on the ‘Color’ swatch to change the first colour. 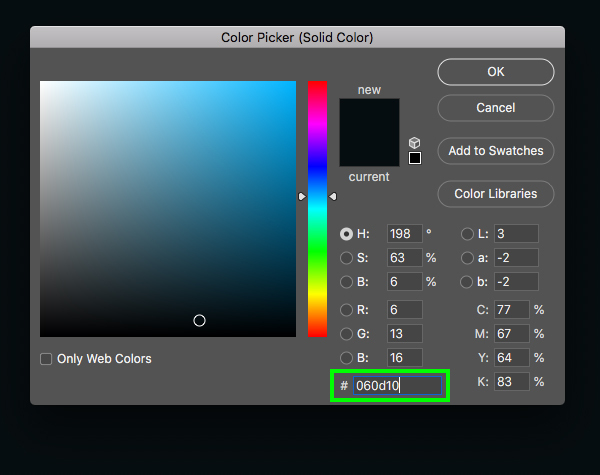 You should now see the ‘Color Picker’ where we can enter the hex value ‘#141D35’ and then press ‘OK’. 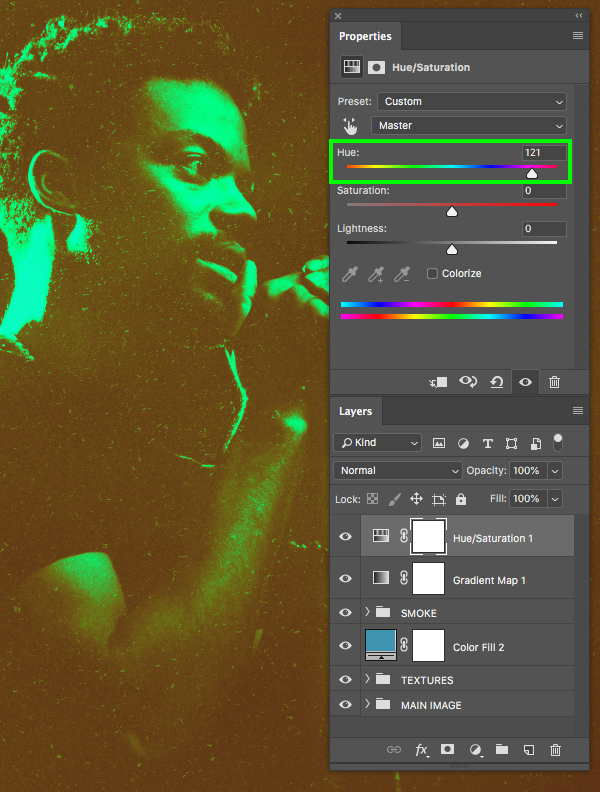 Now click on the small square at the bottom right of the Gradient Editor and then click on the ‘Color’ swatch again. 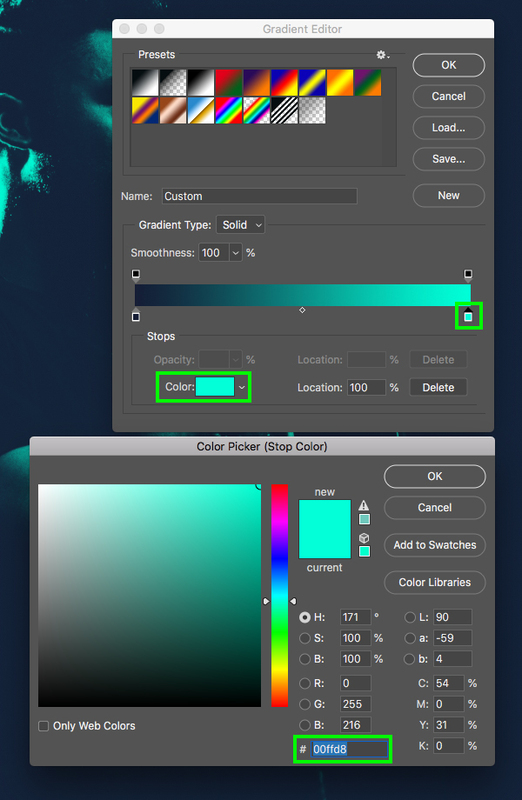 This time, enter the hex value ’00FFD8′ and then press ‘OK’ or hit ‘Return’ on the keyboard twice to apply the changes and close out of the Gradient Editor. Return to the Adjustment Layer icon and add another ‘Black & White…’ adjustment to the top of the stack. 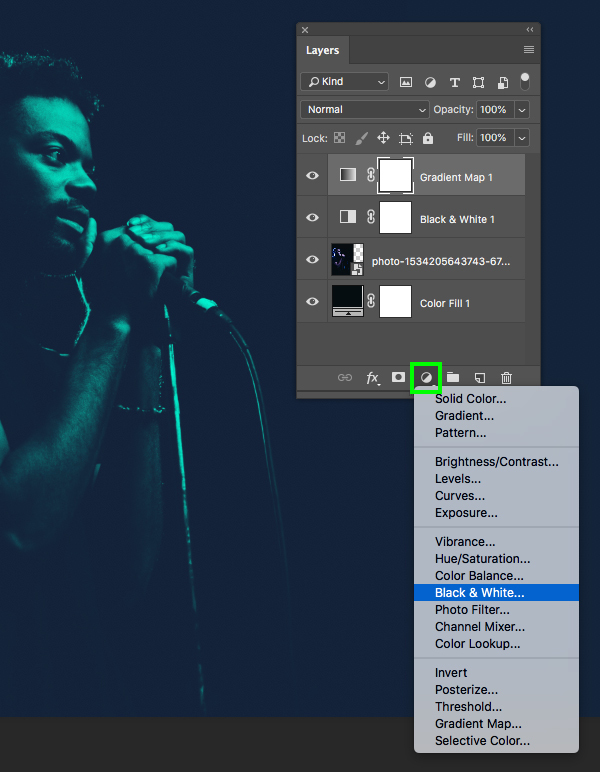 Select the top layer in your Layers Palette, hold the Shift key, and then select the very bottom ‘Color Fill 1’ Adjustment Layer to select all of the layers together. 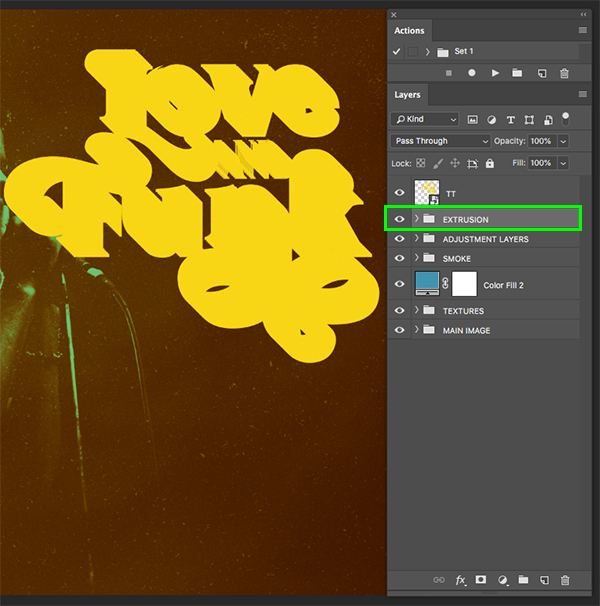 Navigate to the GraphicsFuel texture pack and select the first texture – ‘overlay-texture1.jpg’ and then choose ‘Place’ from the bottom right-hand corner to import the texture into your document. 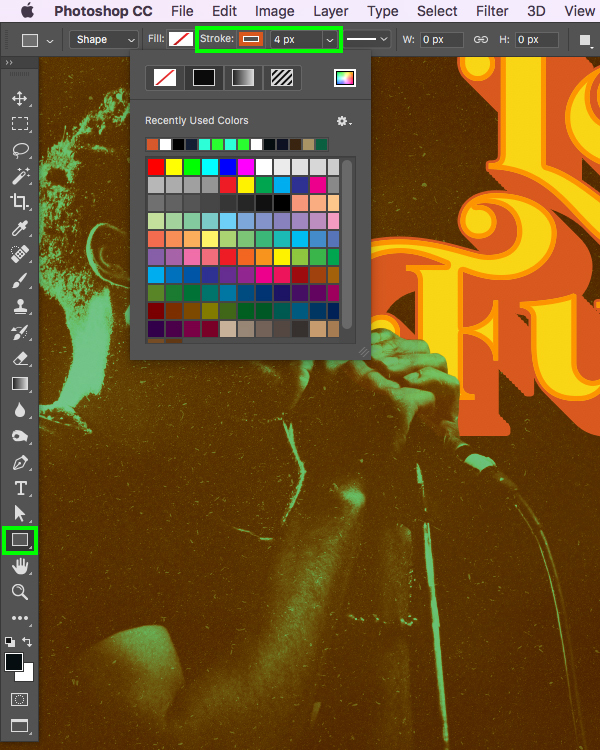 Hold the Alt/Option+Shift keys and scale the texture up from the center until it fills the entire canvas and then press ‘Return’ to apply the transformation. 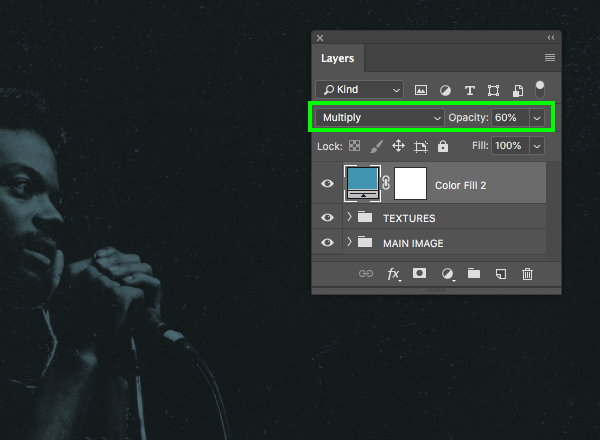 Change the Blend Mode of the texture from ‘Normal’ to ‘Screen’ and then press ‘5’ on the keyboard to lower the opacity to ‘50%’. 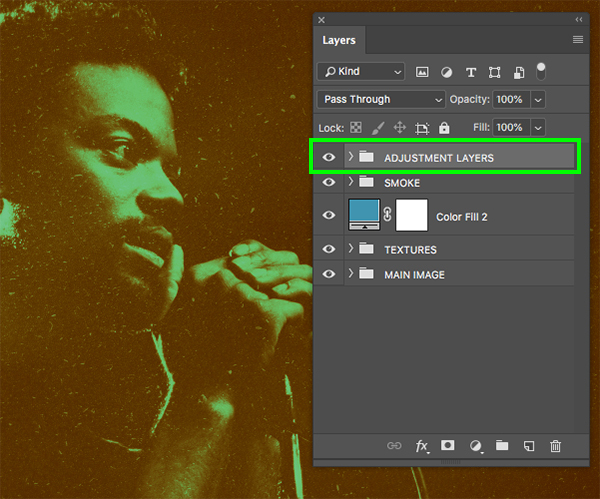 With the texture layer selected, hold the Alt/Option key and click on the Adjustment Layer icon at the bottom of the Layers Palette. 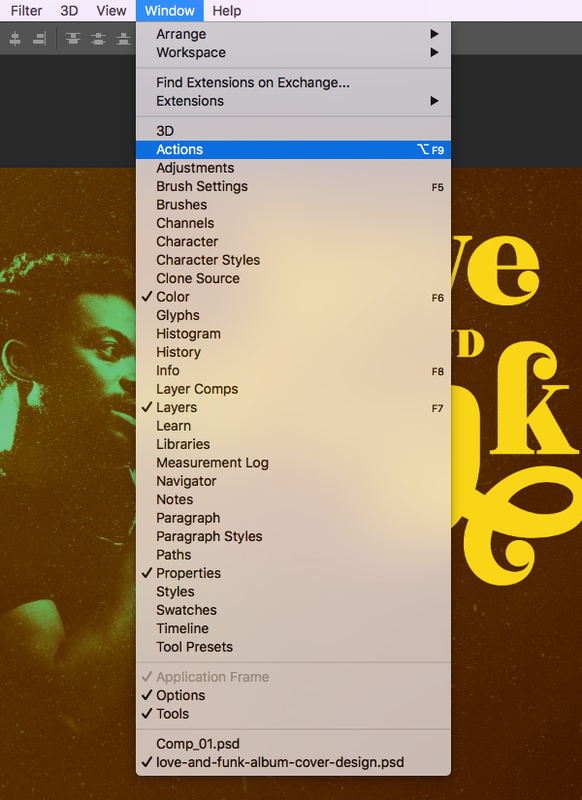 From here, choose ‘Levels…’ from the list. 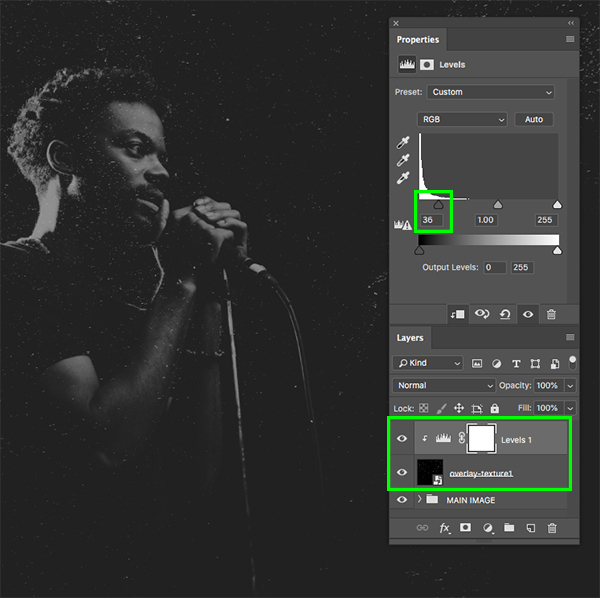 When prompted with the ‘New Layer’ dialog box, check off the ‘Use Previous Layer to Create Clipping Mask’ option and then press ‘OK’ to continue. 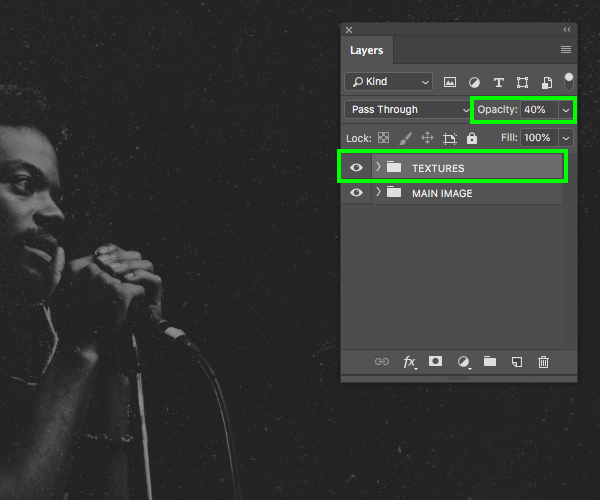 In the Properties panel, move the left slider in towards the center until it’s set to ’36’ to add some contrast to the texture. 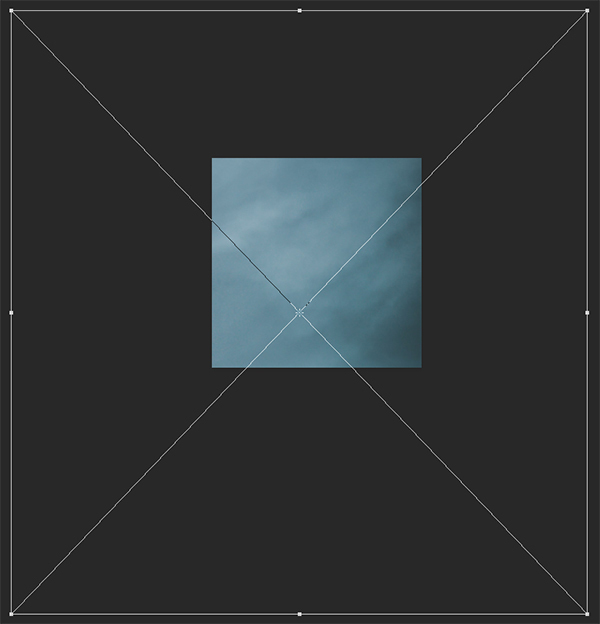 The Levels Adjustment Layer should also have a Clipping Mask applied to it that will ensure the adjustment only affects the layer directly below it, which is what we want! 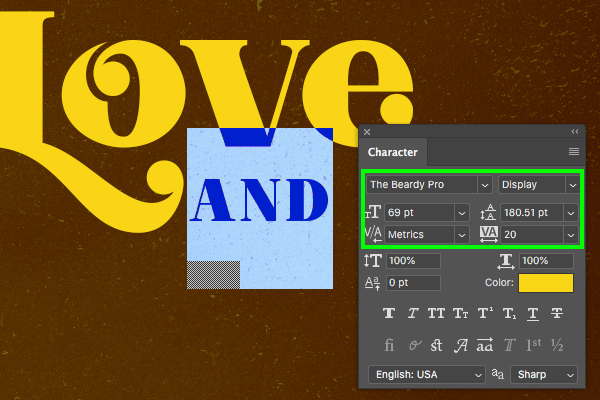 This time let’s navigate to the Graphic Burger textures and select ’02.png’ before choosing ‘Place’ from the lower right corner. 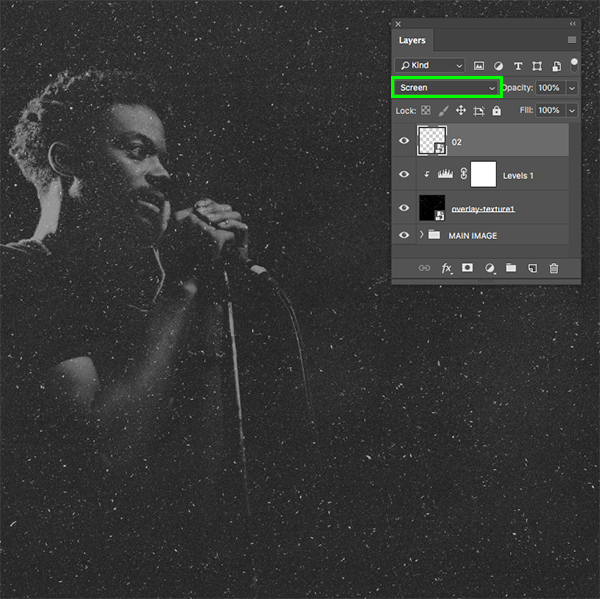 Once the texture is brought into your document, scale it up by dragging outwards from any four corners of the bounding box while holding the Alt/Option+Shift keys until the texture fills the canvas, and then press ‘Return’ to apply the transformation. 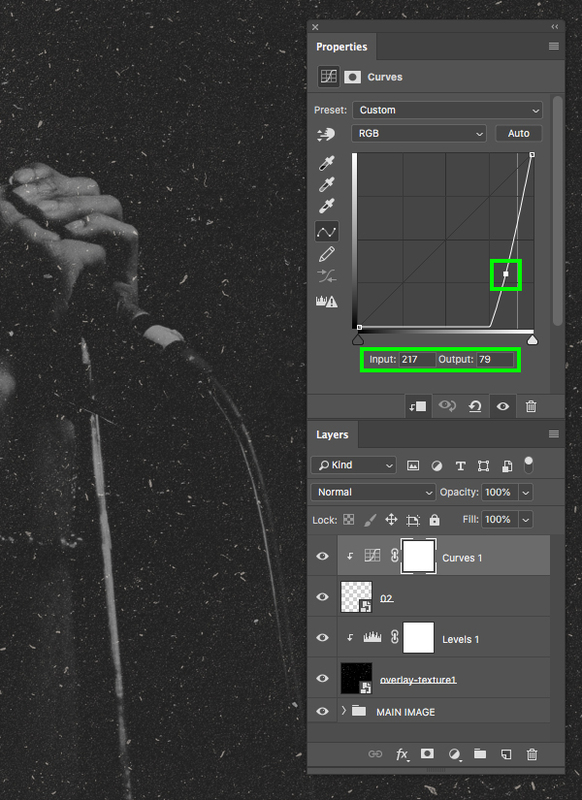 After that, change the Blend Mode of the layer to ‘Screen’ to allow the image to show through. 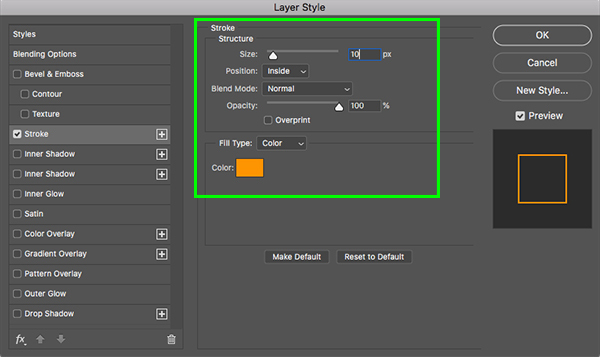 With the top texture Smart Object layer selected, hold the Alt/Option key and click on the Adjustment Layer icon at the bottom of the Layers Palette before choosing ‘Curves…’ from the drop-down menu. 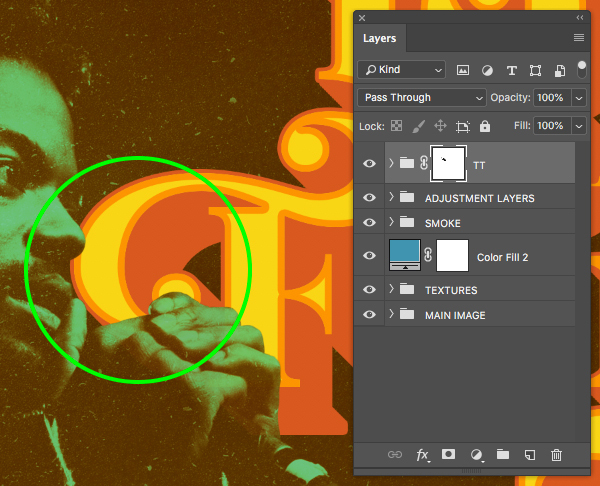 When prompted with the next panel, check off the ‘Use Previous Layer to Create Clipping Mask’ option once again. 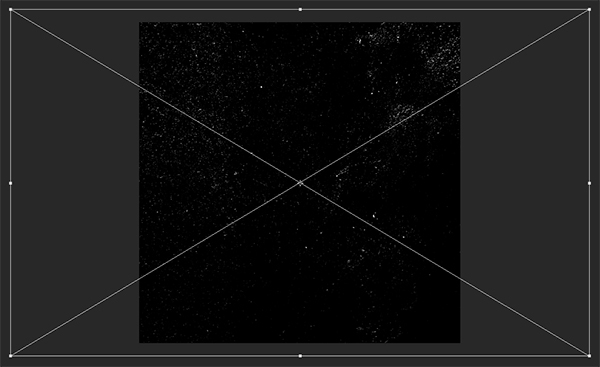 In the Properties panel, click to make a point in the center of the grid and then move it over to the far right and down so that the ‘Input’ is set to ‘217’ and the ‘Output’ is set to ’79’. 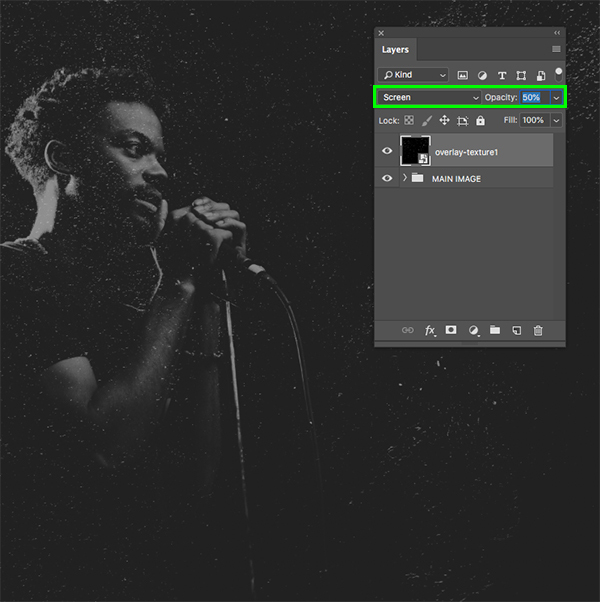 Select the top Curves Adjustment Layer, hold the Shift key, and then select the ‘overlay-texture1’ layer so both textures and Adjustment Layers are selected at the same time. 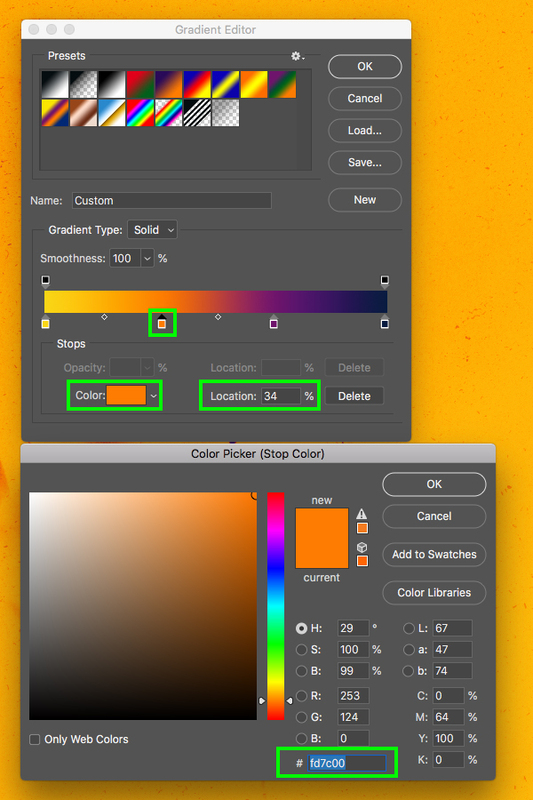 Make sure that the ‘TEXTURES’ folder is selected and then click on the Adjustment Layer icon at the bottom of the Layers Palette and choose ‘Solid Color…’ from the list. 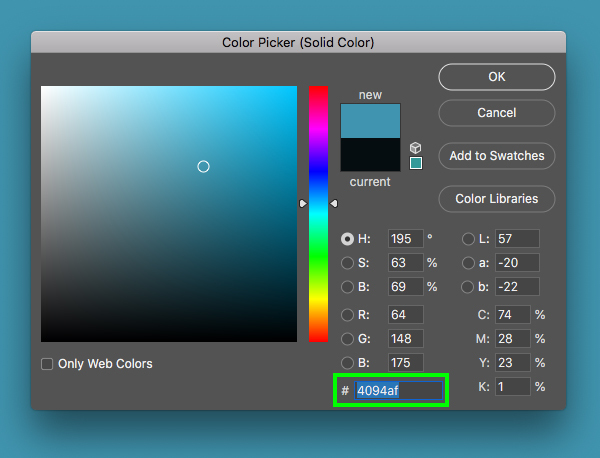 For the fill colour enter the hex value ‘#4094AF’ and then press ‘Return’ or click ‘OK’ to proceed. 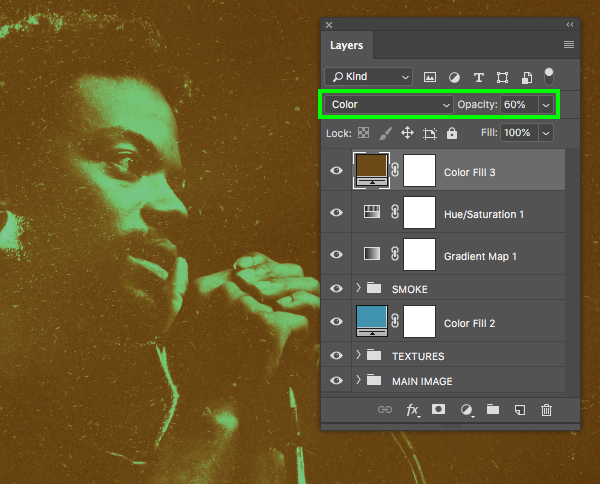 After adding the solid colour to the top of the Layers Palette, change the Blend Mode from ‘Normal’ to ‘Multiply’ and then reduce the opacity of the Adjustment Layer to ‘60%’ by pressing the number ‘6’ on the keyboard. 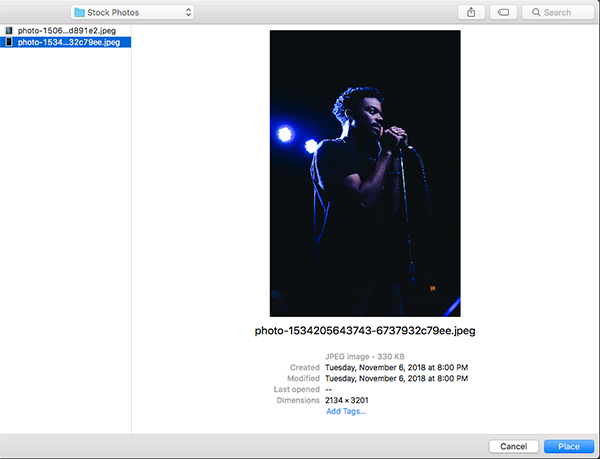 Next, download this second free stock image from Unsplash and save it with your other files. 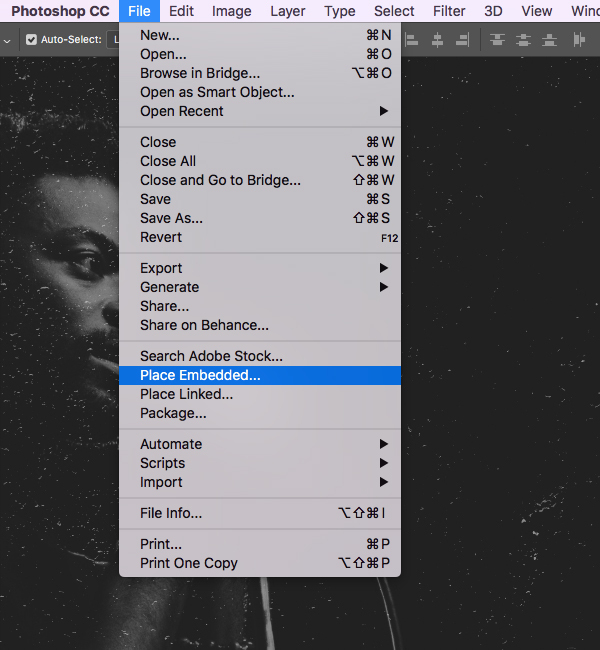 Once you have done that, come back to Photoshop and go to the File menu before choosing ‘Place Embedded…’ from the menu once again. 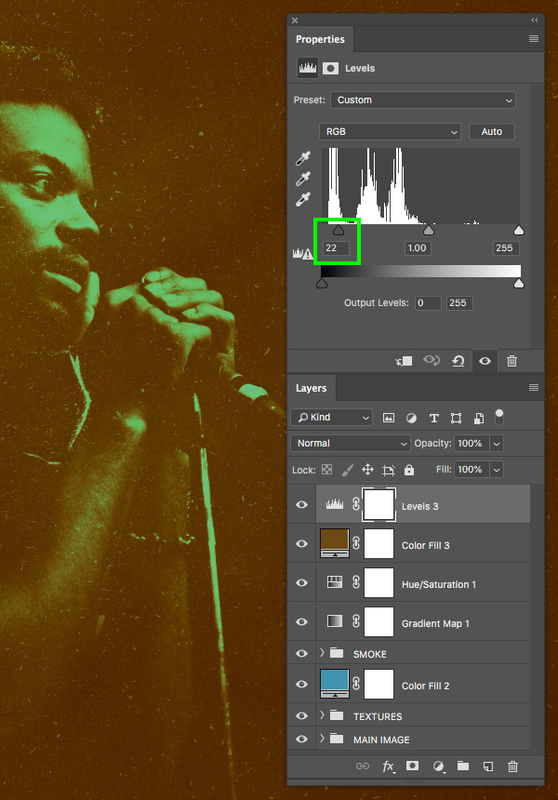 Navigate to the image of the singer with the smoky background and then choose ‘Place’ to import it as a Smart Object. 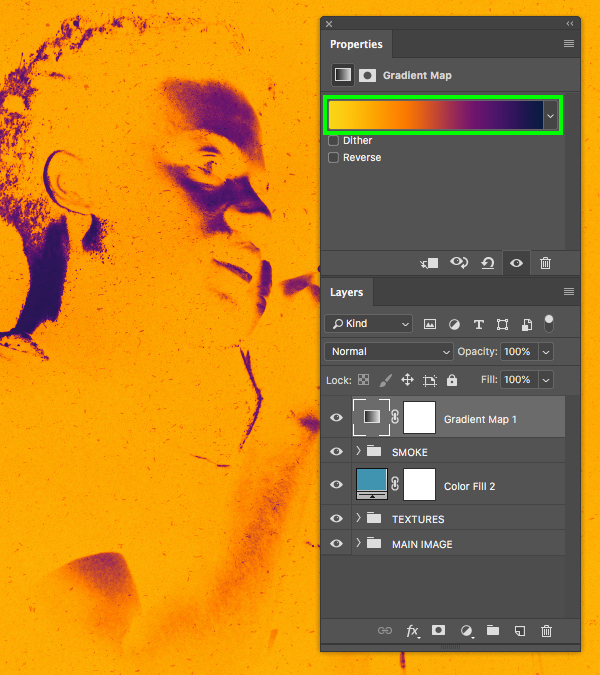 After importing the image, scale it up by dragging outwards while holding Alt/Option+Shift and crop an interesting area of just the smoke before pressing ‘Return’ to apply the transformation once you are happy with the crop. 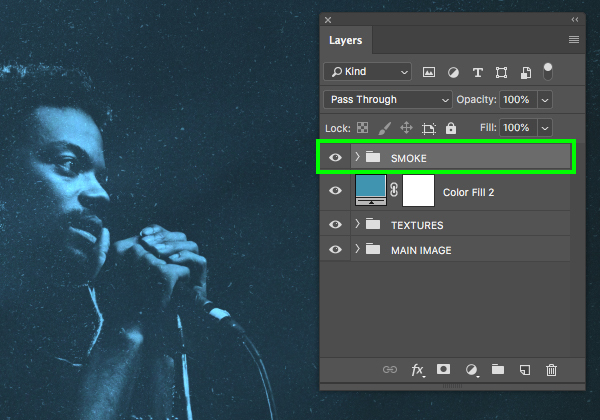 With the smoke layer selected, hold the Alt/Option key and click on the Adjustment Layer icon at the bottom of the Layers Palette before choosing ‘Levels…’ from the list. 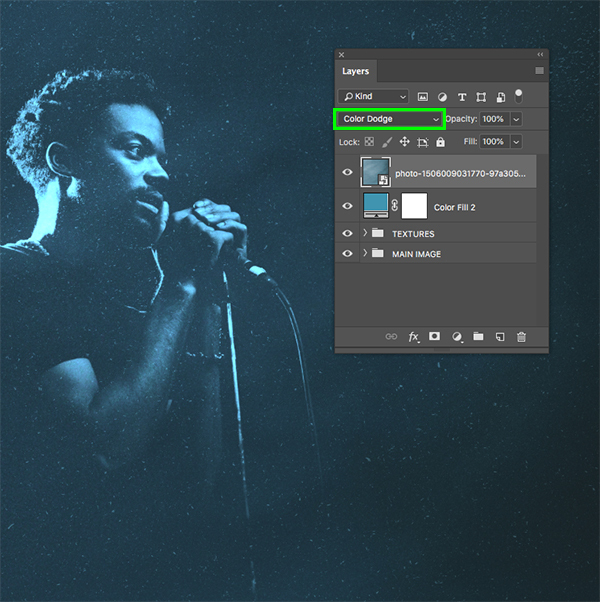 When the pop up menu appears, check off the ‘Use Previous Layer to Create Clipping Mask’ option and then click ‘OK’ or press ‘Return’ on the keyboard to continue. 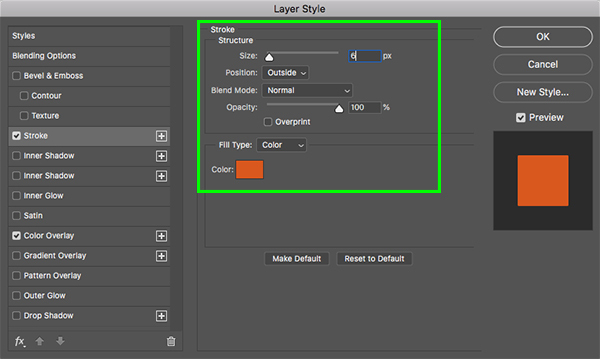 Select the top Levels Adjustment Layer, and then hold the Shift key and select the Smart Object layer below so both layers are selected together. 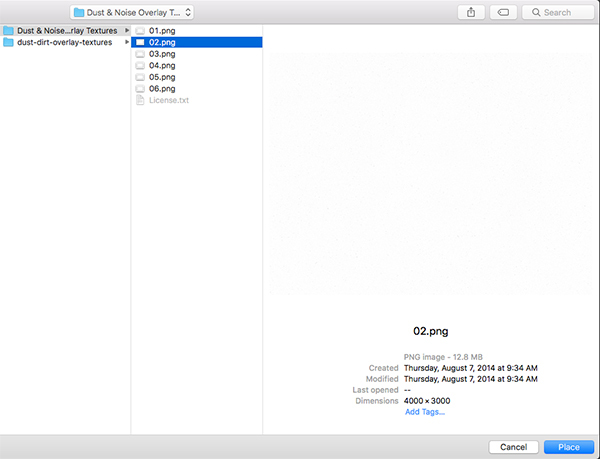 Press Command/Ctrl+G to place the layers into a new folder and then double-click the ‘Group 1’ text to rename the folder ‘SMOKE’. 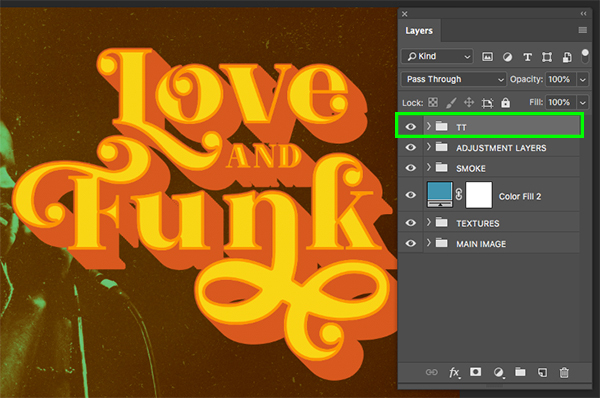 Make sure that the top ‘SMOKE’ folder is selected and then click on the Adjustment Layer icon at the bottom of the Layers Palette and choose ‘Gradient Map…’ from the list. 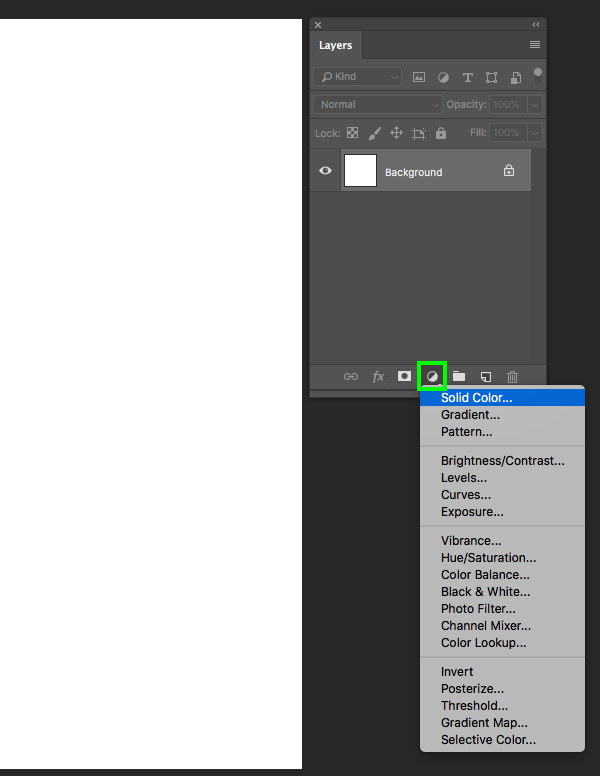 In the Properties panel, click on the colour strip to bring up the panel where we can modify the colours. Click on the far left of the strip in the Gradient Editor and add a bright yellow colour such as ‘#F9D615’ to the colours. 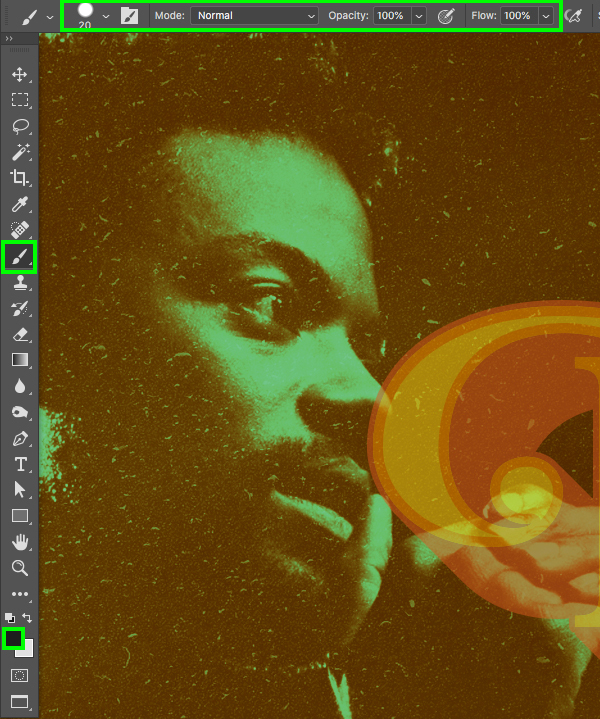 Click along the bottom of the colour strip in the Gradient Editor to add a second colour with a ‘Location’ of ‘34%’ and then enter the hex value ‘#FD7C00’ to add a nice vibrant orange to the gradient. 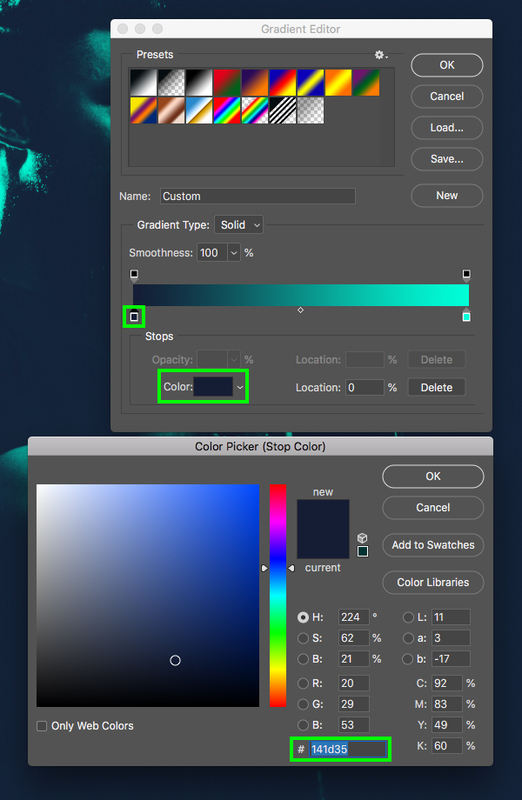 Add a third colour with a ‘Location’ of ‘67%’ and use the hex value ‘#6F156C’ and then click ‘OK’ once again to add this colour to the gradient. 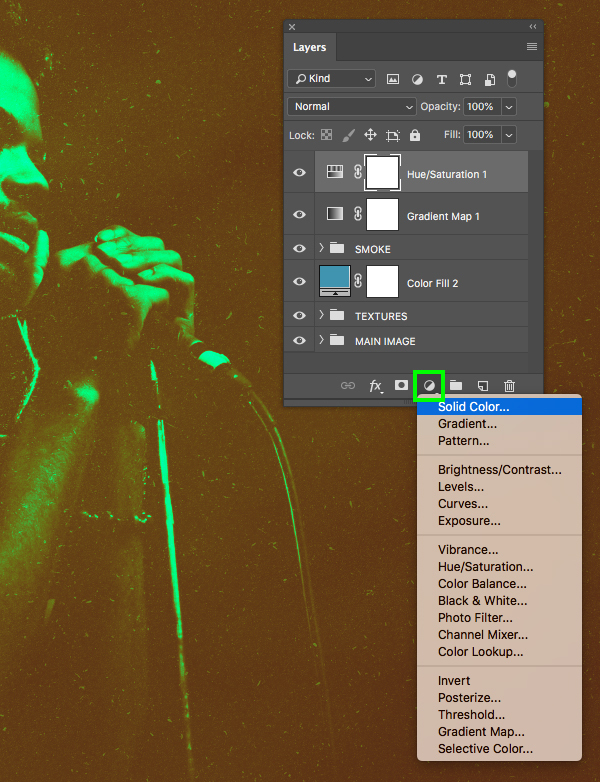 Click along the bottom of the Gradient Editor and add a fourth colour to the far right. This time, enter the hex value ‘#081B40’ to finish off the gradient with a dark, rich blue colour and then press ‘OK’ to apply the changes and close out of both panels. 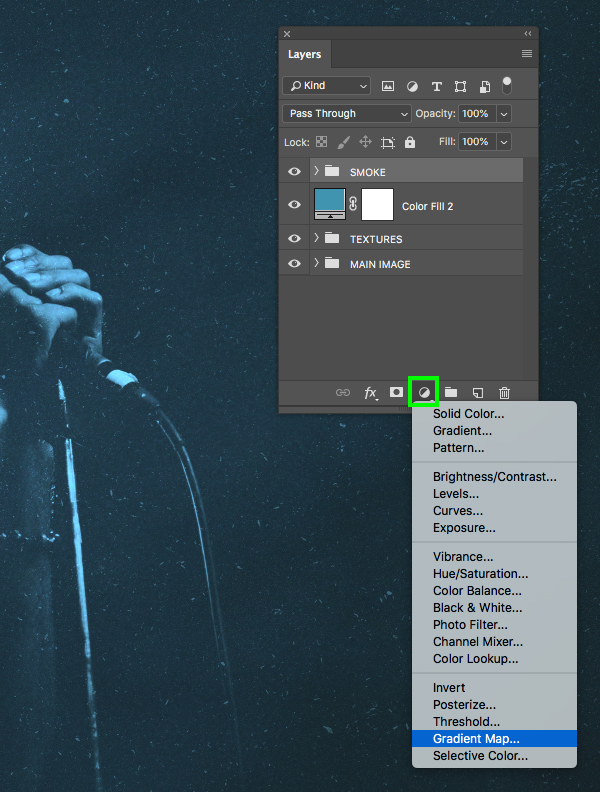 Click the Adjustment Layer icon again and choose ‘Hue/Saturation…’ from the list. 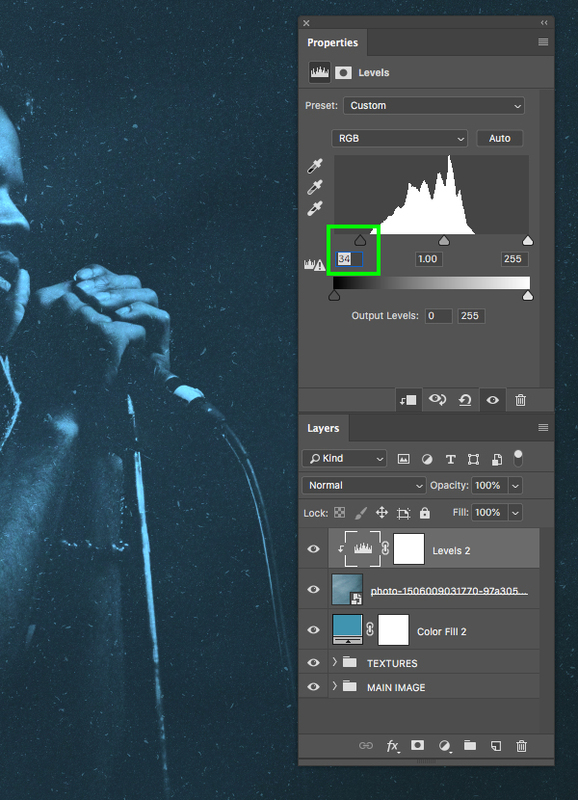 In the Properties panel let’s increase the ‘Hue’ slider to ‘121’ to change the colours. 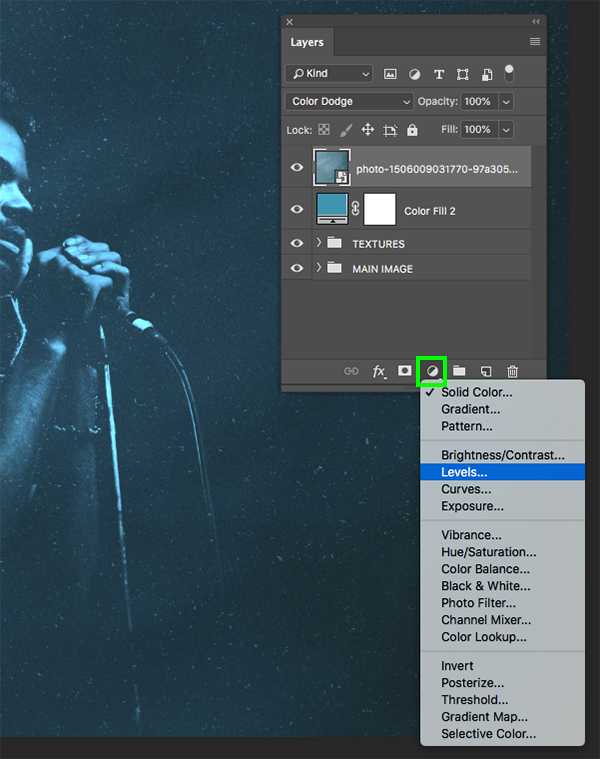 Click the Adjustment Layer icon again and this time choose the ‘Solid Color…’ option. Enter the hex value ‘6D4915’ and then press ‘OK’ to continue. 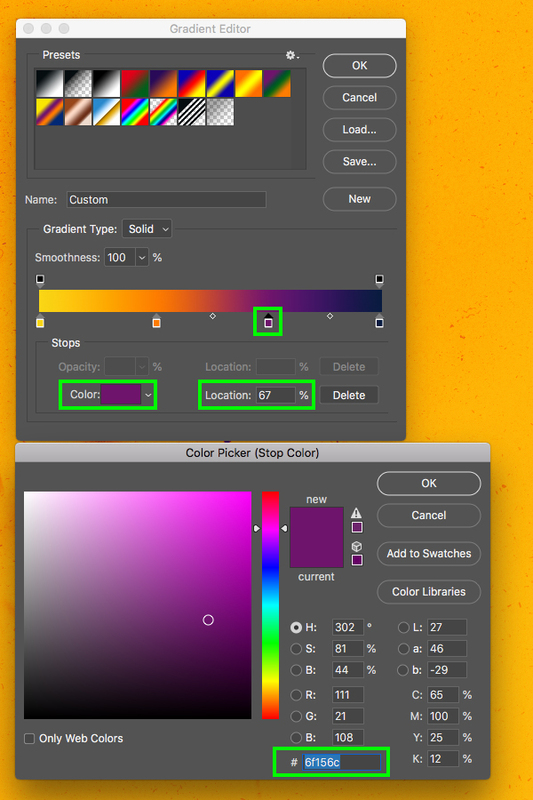 After applying the solid colour, change the Blend Mode of the layer from ‘Normal’ to ‘Color’ and then reduce the opacity of the layer to ‘60%’ by pressing the number ‘6’ on the keyboard. 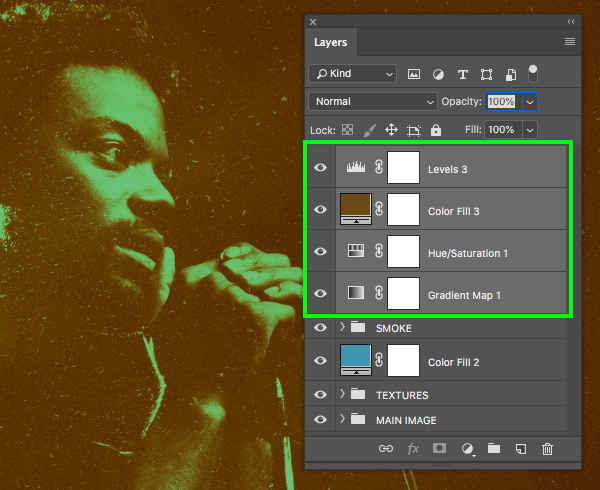 Make sure that the top Adjustment Layer is selected in your Layers Palette and then click on the Adjustment Layer icon at the bottom. 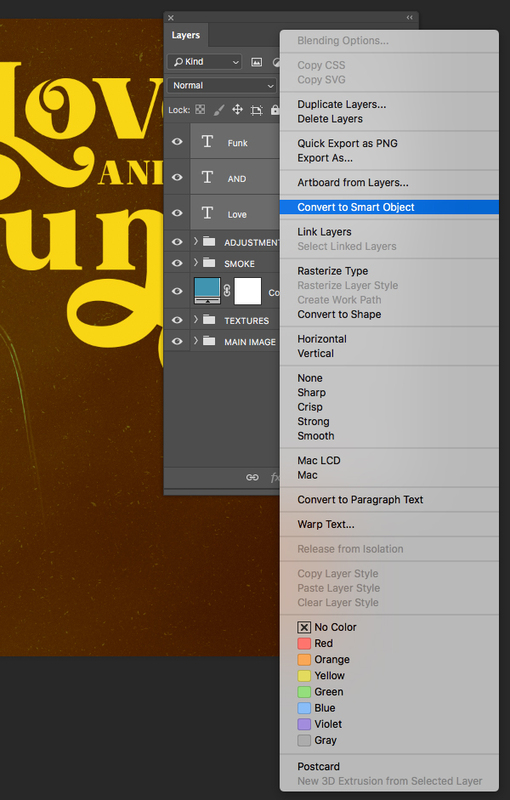 From the list that appears we now want to choose ‘Levels…’ to add it to the top of all of our layers. 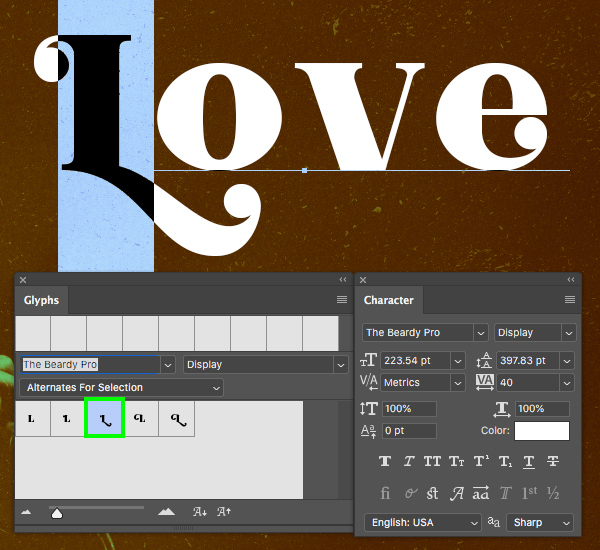 Open the ‘Glyphs’ panel from the Window menu and then use the Type Tool (T) to highlight the uppercase ‘L’ and then you can choose one of the alternates from the Glyphs panel. Here I will be selecting the middle alternate as it has a nice swirl on the bottom. 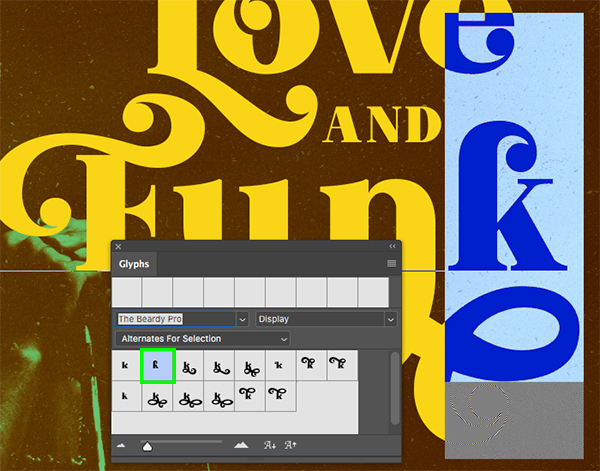 Highlight the lowercase ‘o’ and choose the alternate for that character next. 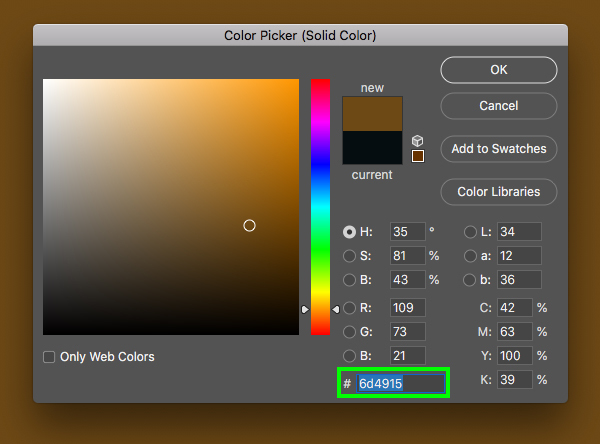 Highlight all of the text and then click on the ‘Color’ swatch and change the fill colour to ‘#F9D615’. Let’s also manually adjust the kerning a bit by moving our cursor in between two characters and then pressing Alt/Option and the left arrow to remove some of the space between each of the letters until it looks nice and even. 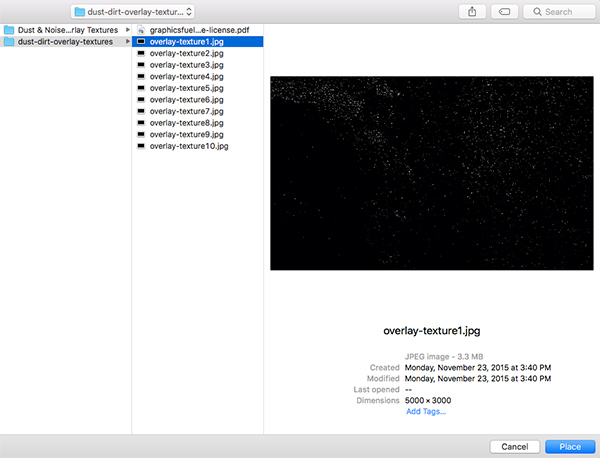 Rename the Smart Object layer ‘TT’. 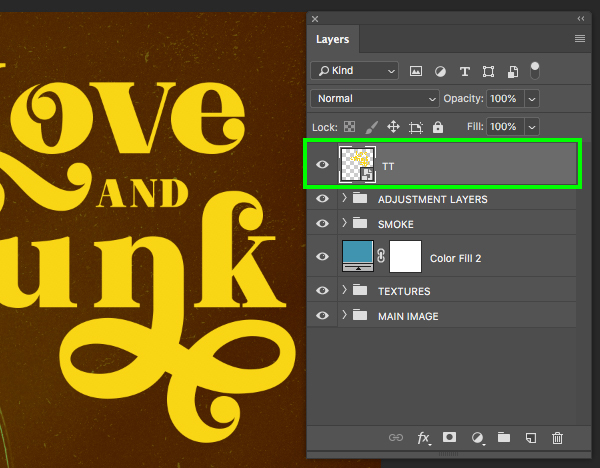 Next, select the ‘TT’ Smart Object layer, press Command/Ctrl+J to duplicate it, and then press Command/Ctrl and the left bracket key to move this layer below the original ‘TT’ layer. Go to the Window menu and choose ‘Actions’ from the dropdown menu. After opening the Actions window, click on the ‘New Action’ icon from the lower right of the panel. Once you’ve done that you will be asked to name your action so let’s just call it ‘EXTRUDE’. After you’ve given the action a name, hit the ‘Record’ button. 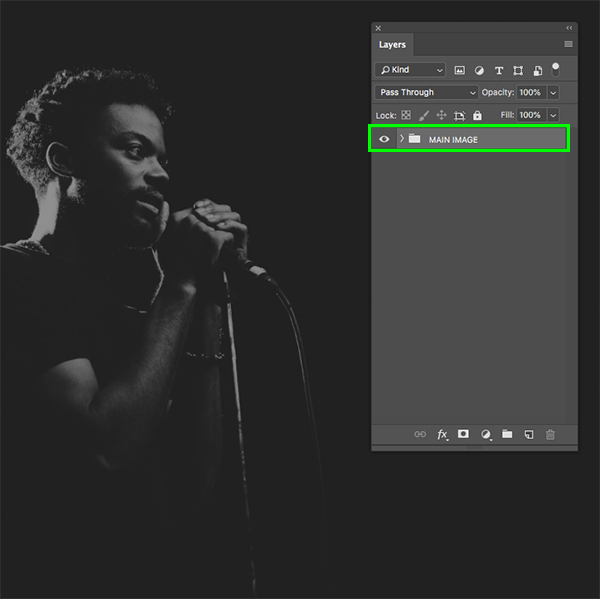 Now that we’ve started recording we can create our very basic Photoshop action. This isn’t recording in real time so there’s no need to rush! 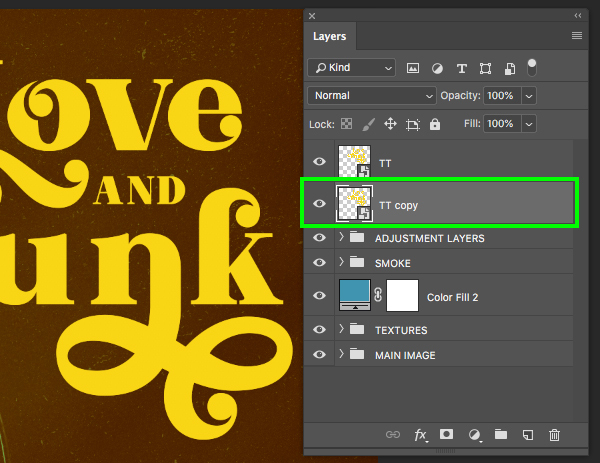 Let’ start by selecting the ‘TT copy’ layer and then pressing Command/Ctrl+J to duplicate it. After that, press Command/Ctrl and the left bracket to move this new copy below the previous copy. After that, press the down arrow once, and then the right arrow once. After you’ve done that, click on the stop button to stop recording. 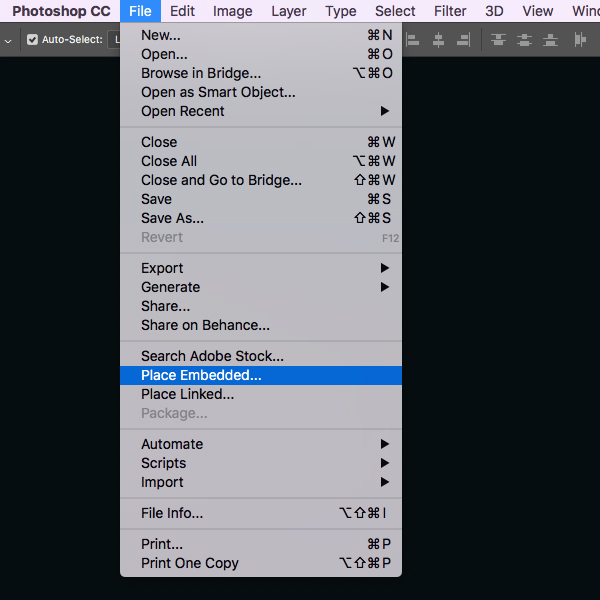 You have now made your own reusable Photoshop action! What we’re going to do from here is select the ‘TT copy 2’ layer and then simply press the play button in the Action panel about 20-25 times. 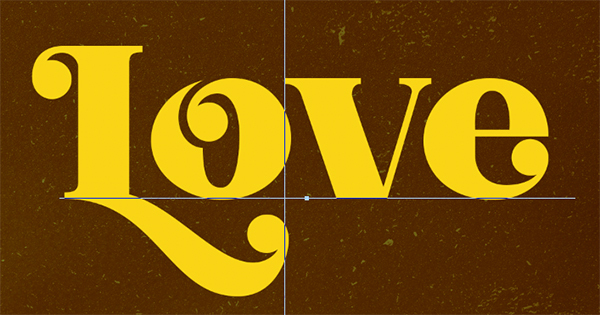 Doing this will repeat the action and create an extrusion effect that will give our text a seamless long shadow. 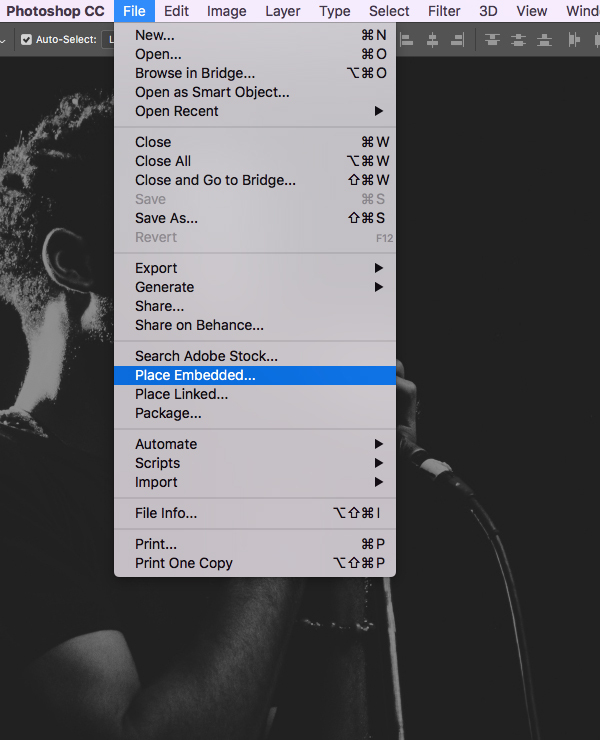 Once you have created all of your copies, select the top copy just below the main ‘TT’ Smart Object layer, hold the Shift key, and then select the bottom copy so they are all selected together. 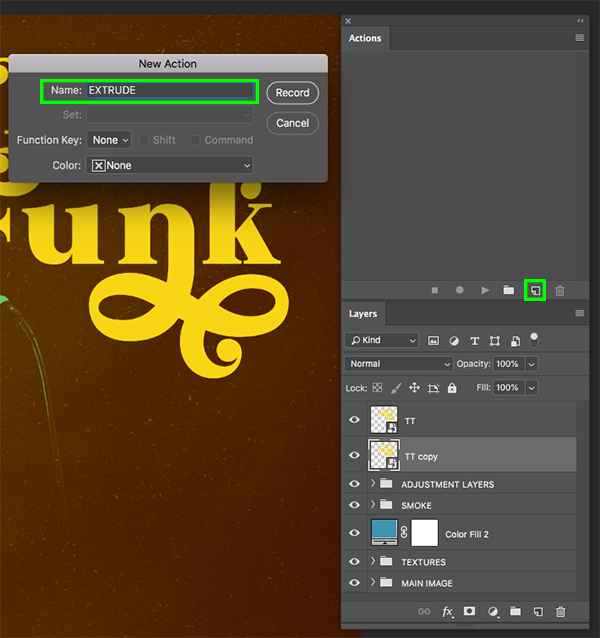 Next, double click on the ‘EXTRUSION’ folder to open the Layer Style window and check off the ‘Color Overlay’ option. Enter the hex value ‘#D9581F’ and then press ‘OK’ to continue. 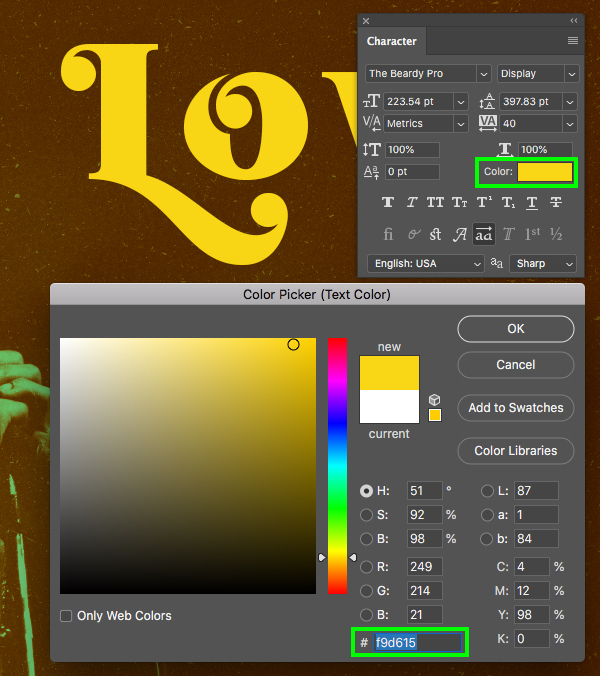 Next, check off the ‘Stroke’ option and add a ‘6 px’ stroke set to a ‘Position’ of ‘Outside’ using the same fill colour as the Color Overlay – ‘#D9581F’. 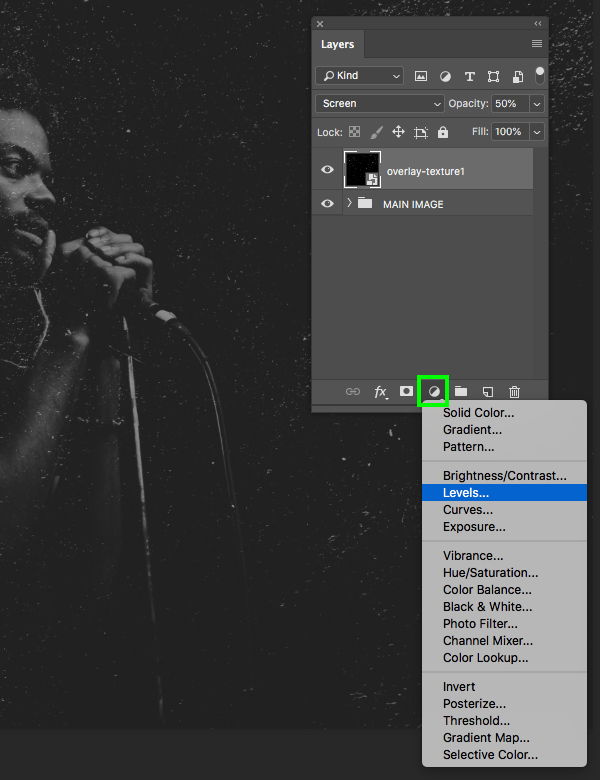 Once you’ve added that, click ‘OK’ to close out and apply the changes. 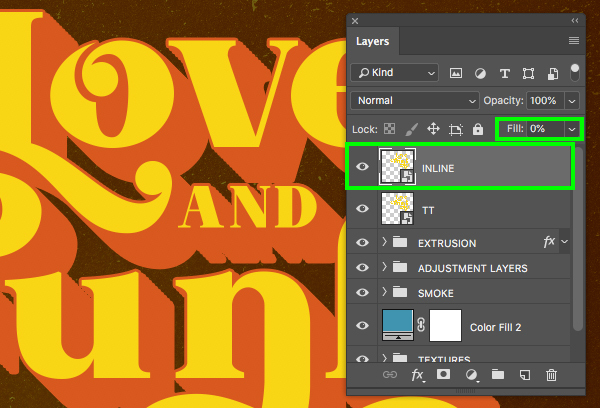 Double click on the ‘INLINE’ Smart Object to open the Layer Style window and then check off the ‘Stroke’ option once again. 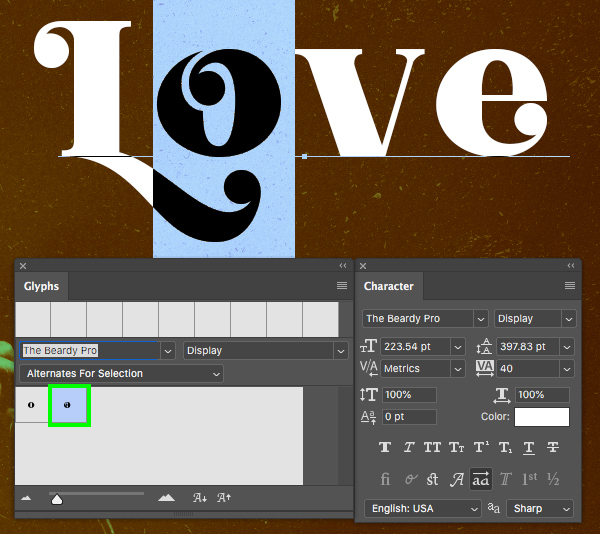 This time let’s make the ‘Size’ about ’10 px’ and then change the ‘Position’ to ‘Inside’. 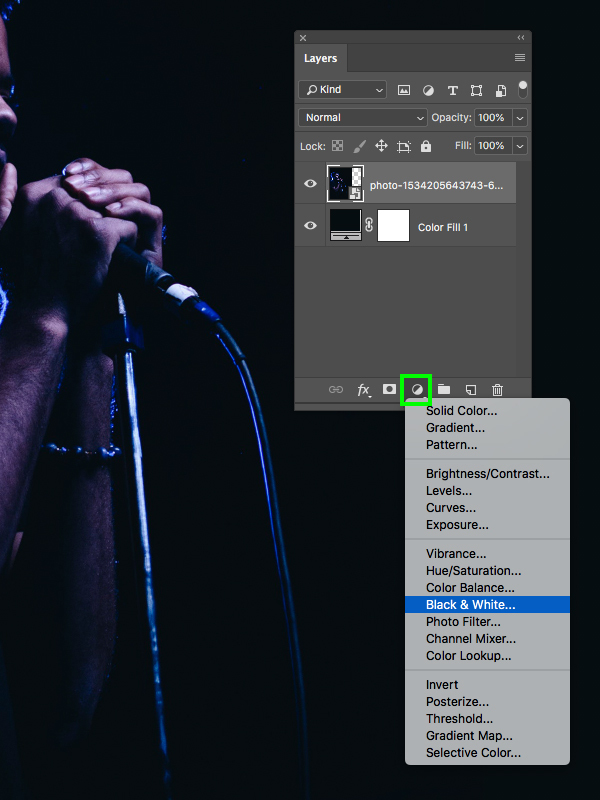 From here, click on the ‘Color’ box to change the fill. 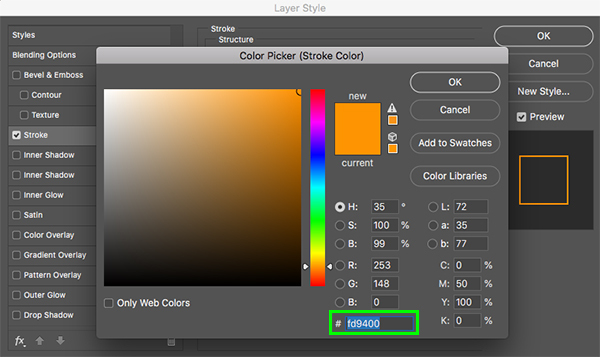 For the fill color, enter the hex value ‘#FD9400’ and then press ‘OK’ twice to apply the changes and close out of both dialog boxes. 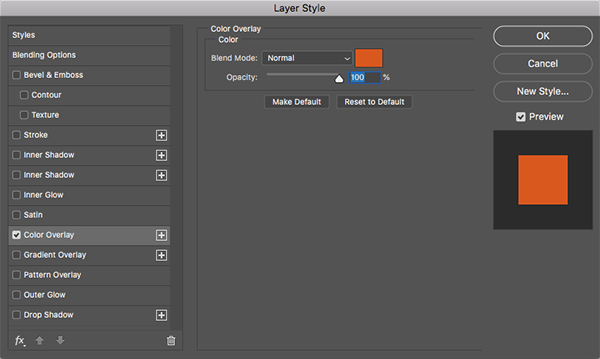 Next, select the top ‘INLINE’ layer and then hold the Shift key and select the ‘EXTRUSION’ group folder so all of the text layers are selected together. 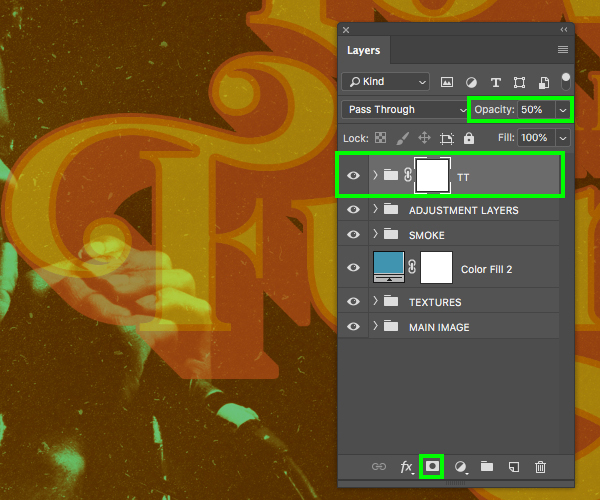 Select the newly created ‘TT’ folder and then press ‘5’ to reduce the opacity to ‘50%’ before clicking on the ‘Add Layer Mask’ icon from the bottom of the Layers Palette. 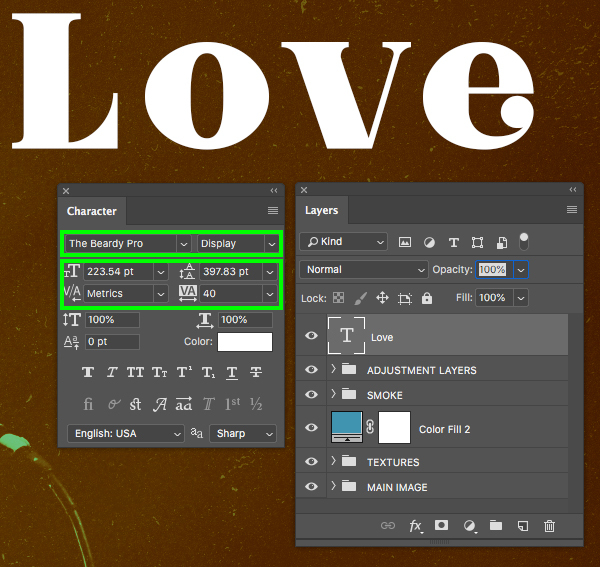 Press Command/Ctrl+J to duplicate the layer and then move it down below the previous text layer. 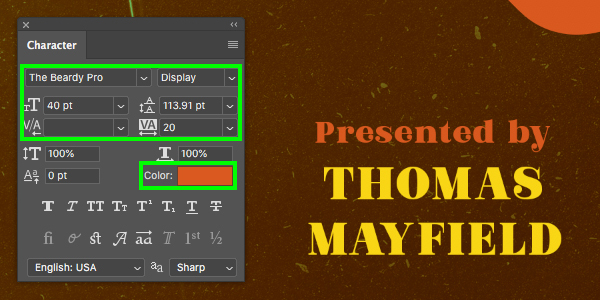 Use the Type Tool (T) to click inside and change the text to read ‘MAYFIELD’ in all caps once again using the same settings as before. 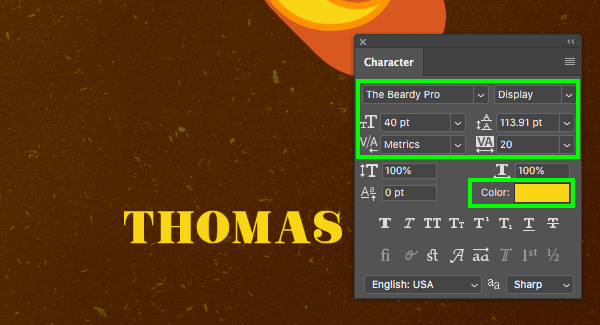 Add a third line of text above the name and type out the words ‘Presented by’ in upper and lower case. 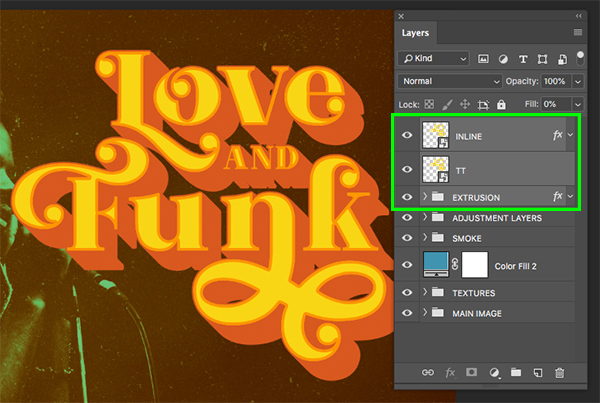 Here let’s click on the ‘Color’ swatch and then use the eyedropper to sample some of the orange color from the ‘EXTRUSION’ in our main title. Press ‘U’ on the keyboard and then check along the top toolbar to make sure that we have ‘None’ for the ‘Fill’ color and then add a ‘Stroke’ of ‘4 px’. 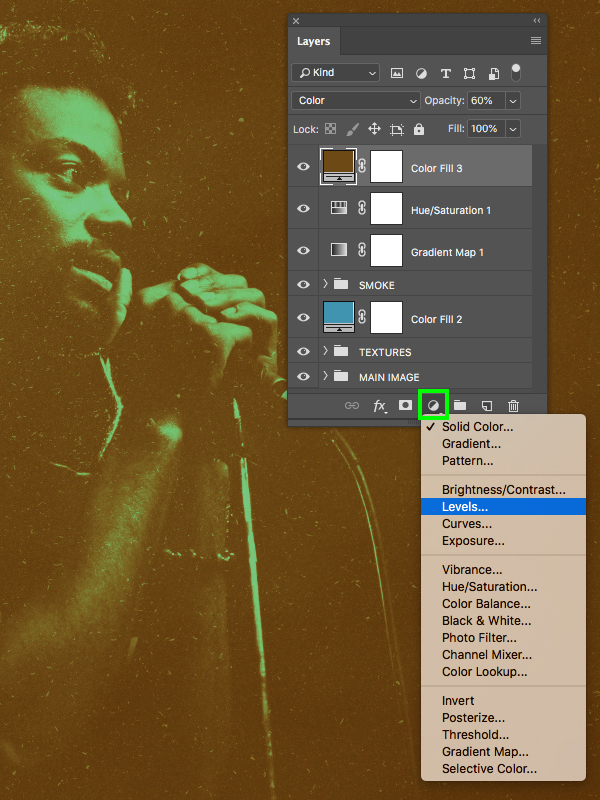 From here, click on the outline box and then click on the rainbow colored icon in the upper right of the color panel. 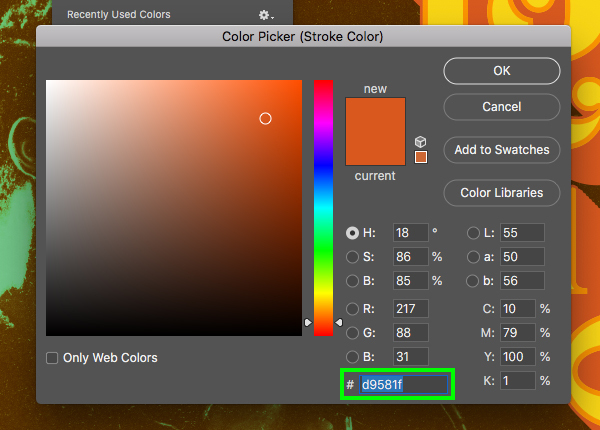 For the stroke color, let’s enter a hex value of ‘#D9581F’ and then click ‘OK’ to proceed. 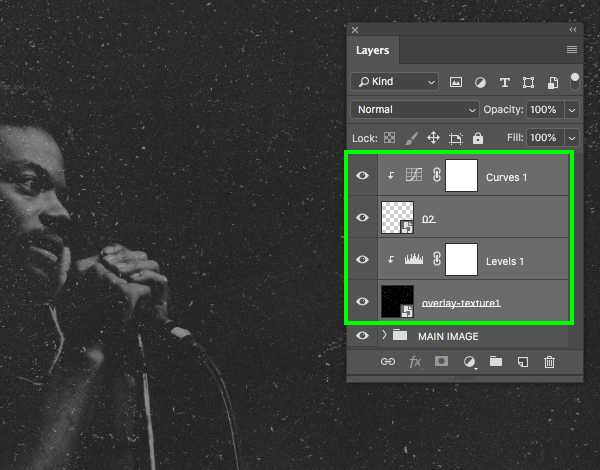 With the top ‘BORDER’ layer selected, click on the Adjustment Layer icon and then choose ‘Curves…’ to add a new Adjustment Layer above all of the other layers. 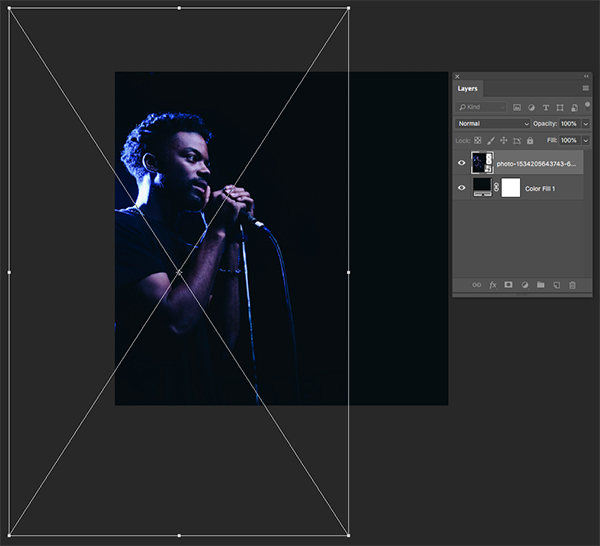 In the Properties panel, click in the center of the grid to add a point and then drag it slightly down and to the right so that the ‘Input’ is set to ‘140’ and the ‘Output’ is set to ‘115’ to add some more contrast overall. 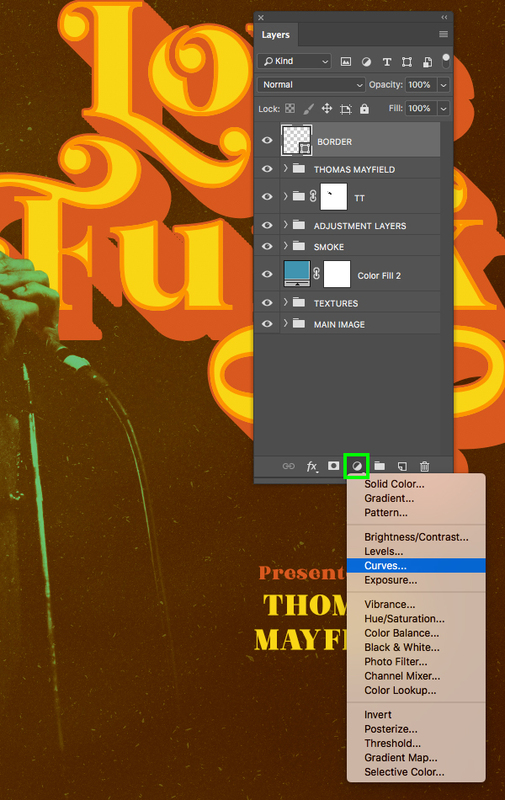 Select the very top Curves Adjustment Layer and then hold the Shift key and select the ‘MAIN IMAGE’ folder at the very bottom of the Layers Palette to select all of your layers and folders together. 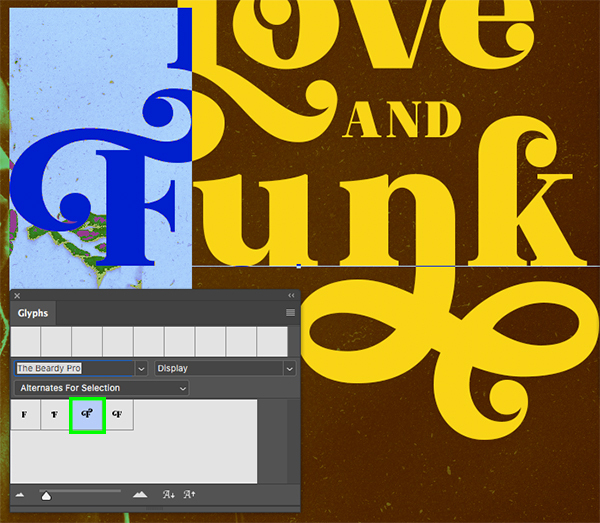 With everything still selected, press Command/Ctrl+G to put everything into one main folder and double click the folder name to change it to ‘ARTWORK’. 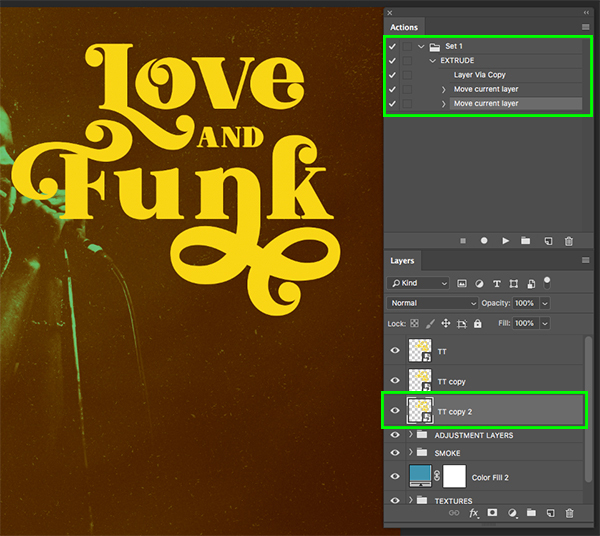 We have now completed our ‘Love And Funk’ album cover design! 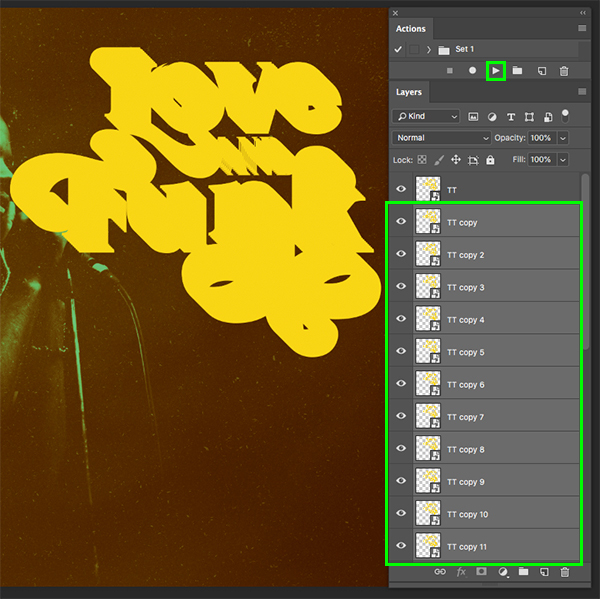 To create our design we’ve used a beautiful retro font and combined it with our own Photoshop Action along with various textures and stock imagery. I hope that you have enjoyed this tutorial and hopefully learned some new techniques along the way. 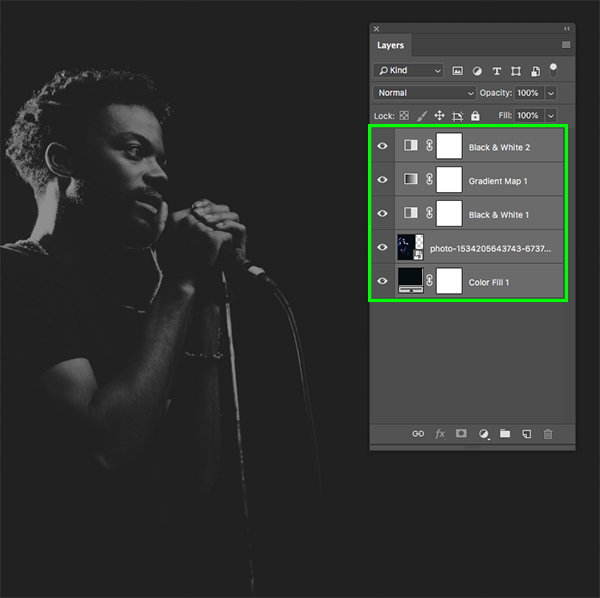 With so many great elements to choose from, this bundle is sure to help you step up your designs and take your work to the next level. I can’t wait to see what you guys do with it! There’s still time to check out The Amazing Designer’s Creative Collection with a huge variety of assets and carefully crafted high quality items all for an unbeatable price of $29! We hope that you found this tutorial super useful Ulrike! I really liked the text treatment. The whole tutorial was good. I think I still have some albums with cover styles like this. 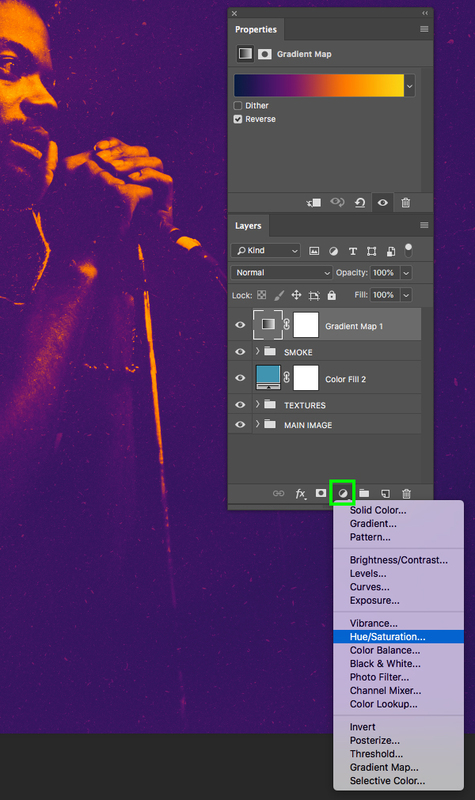 I preferred to have my base colour purple rather than green but it was easy to adjust the settings for that. 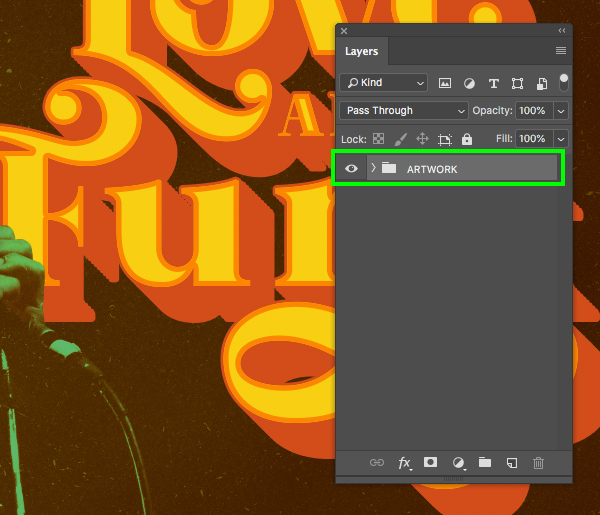 The texture files worked really well to make the graphic look like an authentic old album cover. Nice job Eric! That’s great Jeanne! 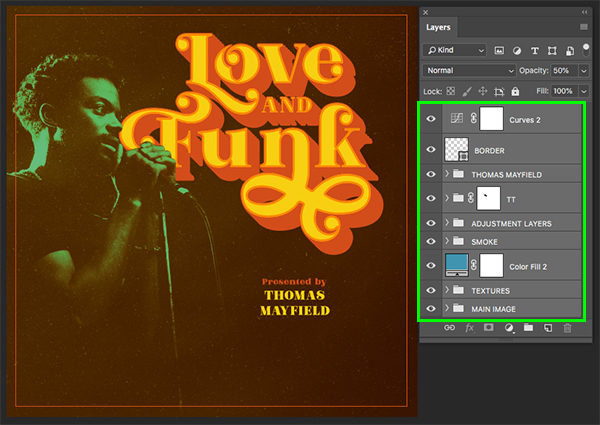 I love retro album covers like this and the typefaces with gritty textures just seemed like the perfect opportunity to try and recreate something just like that. I’m really glad you enjoyed it and found it easy to adjust some of the settings to customize it to your taste! Thank you! Looking forward to doing this! Yay we’re so happy to hear that you are looking forward to working through this tutorial and hope that you have great fun taking it for a spin!